Former quarry with woodland walk and several ponds. 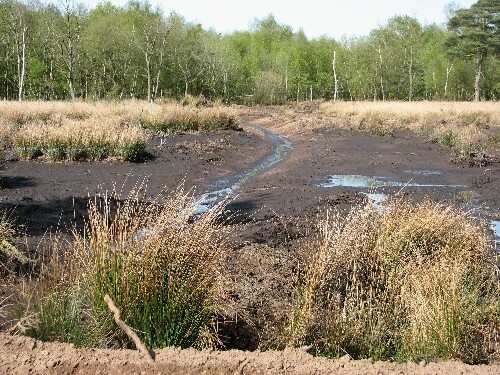 Former peatland extraction site, currently being restored to heathland. 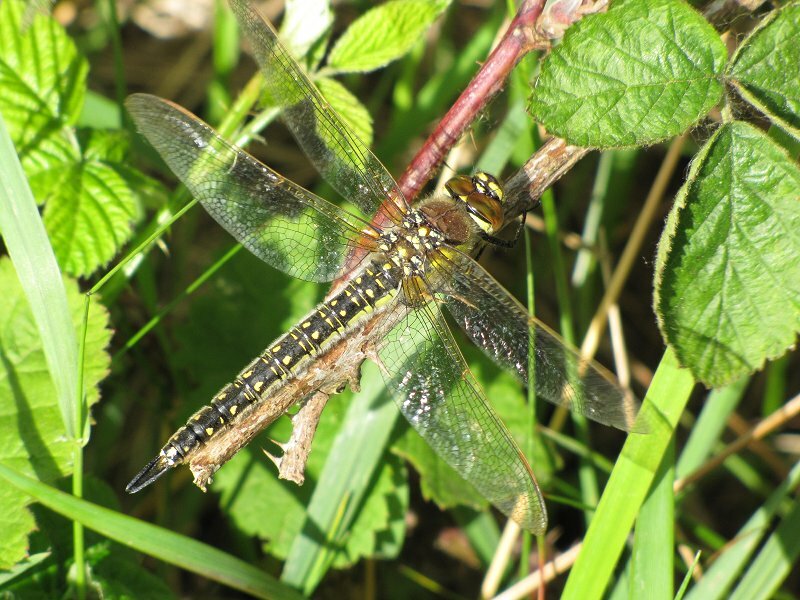 A Yorkshire Wildlife Trust Site – Pastures lined with hedgerows, ponds, lakes and small woodlands. Approach from Arksey or Barnby Dun along Forstead Lane parking near the Norwood Pumping Station. 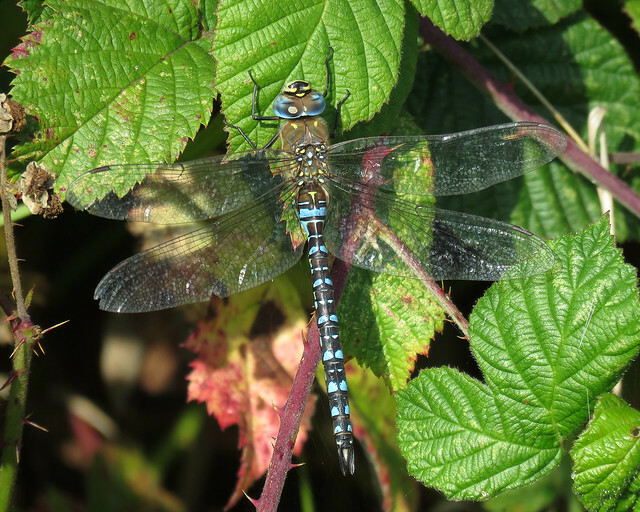 Latest news and sightings can be found on our Facebook Group which is view-able to the public. If you would like to share and interact with the group you will need to signed in with Facebook, and sign up to the group. See the latest photos in our Flickr Group and sign up to share yours. 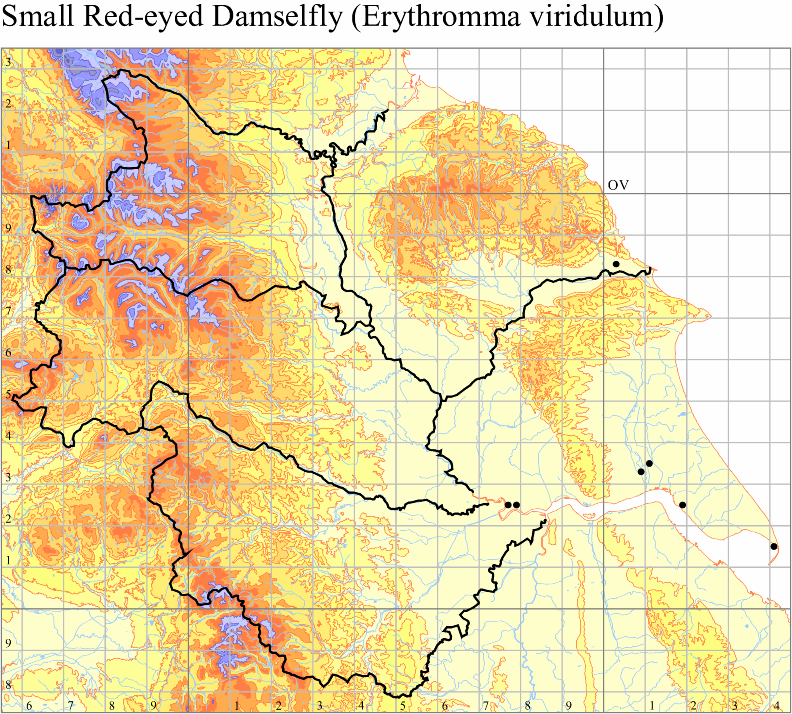 A plan of the site can be downloaded from East Riding of Yorkshire Council’s website. Small pond adjacent to car park. Park in the car park off Thorngumbald Road, east of Paull village, and just east of the gas compound. Spending your holidays in the Algarve? 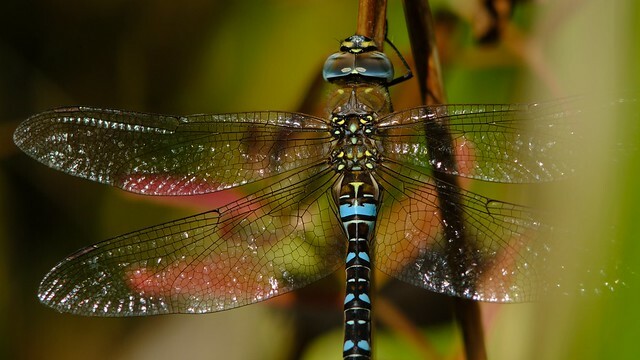 Don’t forget the dragonfly fauna! 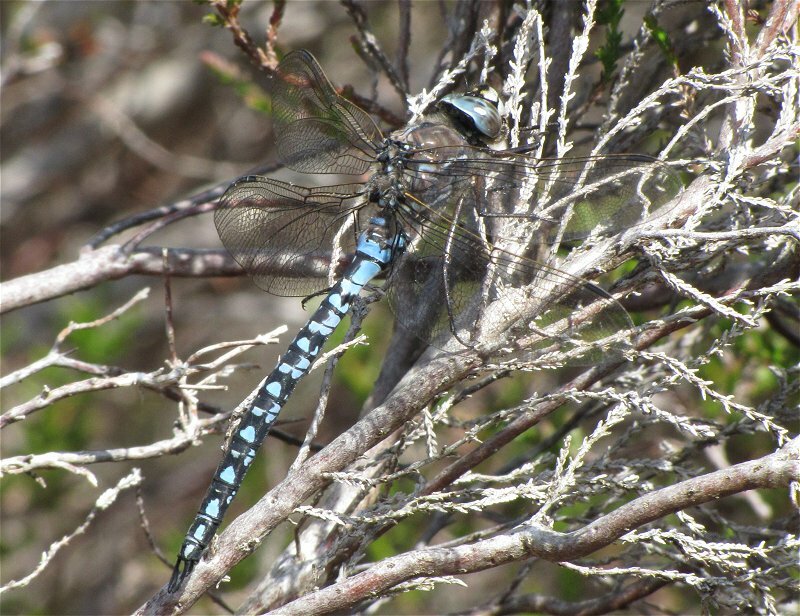 You may be planning to spend your next holiday walking and birdwatching in the Algarve, southern Portugal. 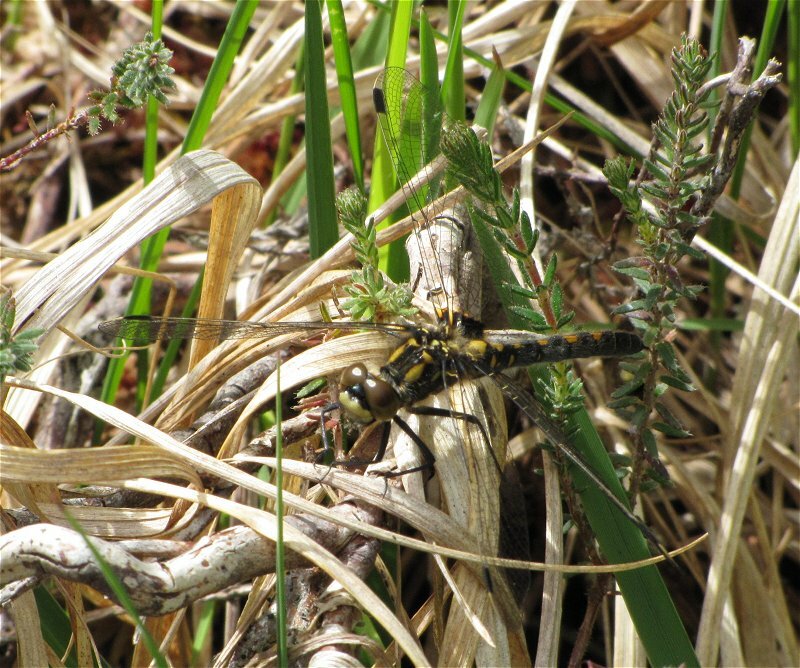 But did you know you can see numerous species of dragonflies in the region? 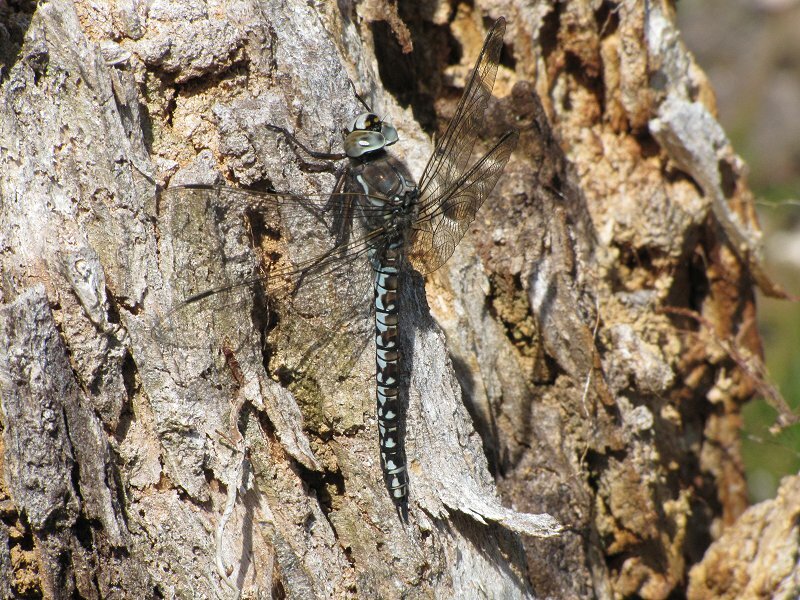 Please take a look at www.odonata-algarve.info which contains detailed information about all the species, flight periods and distribution of Odonata throughout the Algarve. 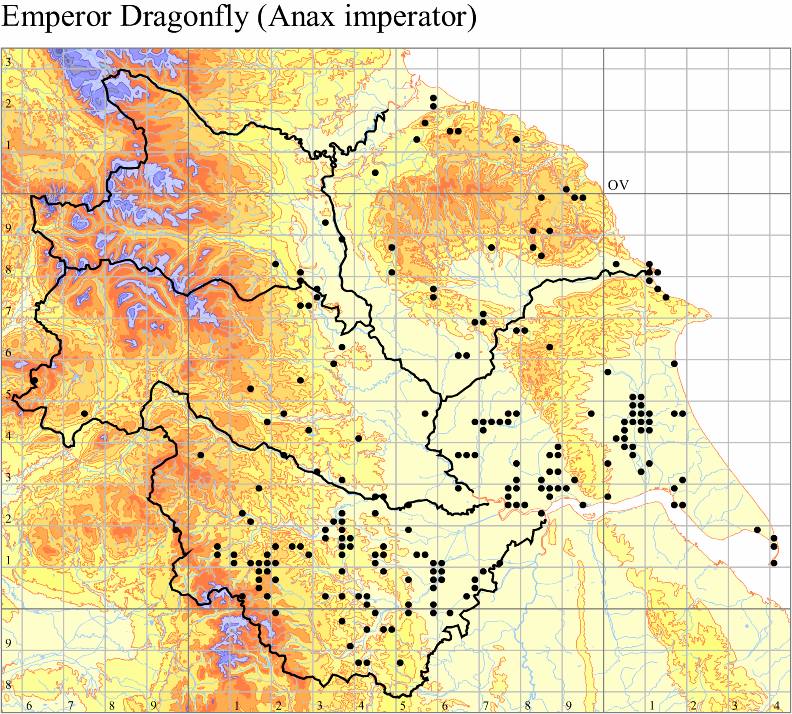 The aim of the site is to encourage the recording of Odonata across the region. 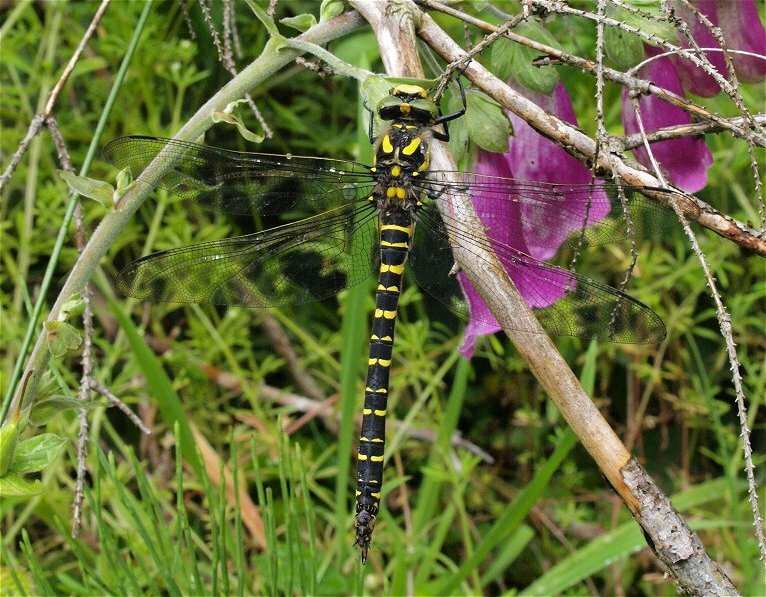 Please share your DAILY SPECIES LISTS with us to enable the Odonata in the Algarve database to increase, as we try to map the distribution of this Order across the region. 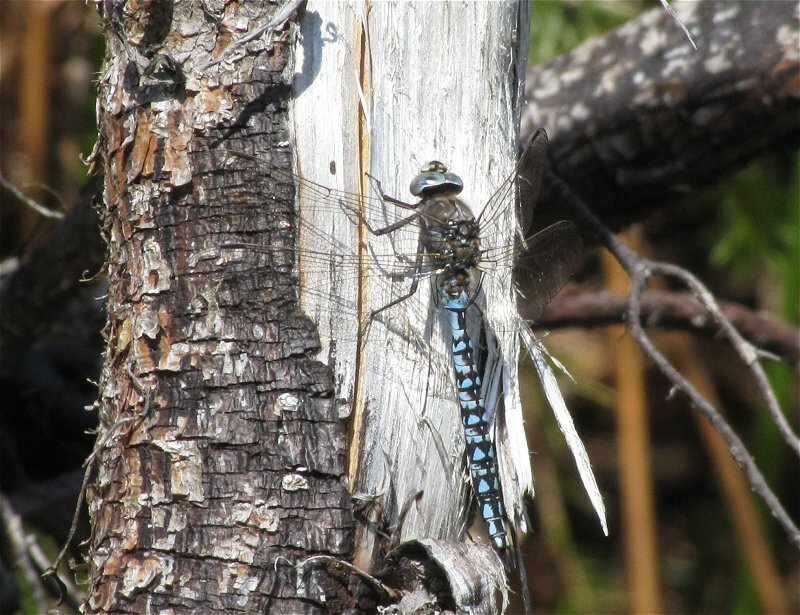 Many thanks in advance and we hope you enjoy watching and recording dragonflies during your holiday! Yorkshire Wildlife Trust Reserve, mainly woodland with an area of heathland in the south-west corner, including a small pond. Take Cliffe Road from either Market Weighton or North Cave. Sands Lane runs west from the village of North Cliffe. Entrance to the reserve can be found at either end of the woodland fronting the lane. Best parking is found at the western entrance. Please stick to the footpath around the edge of the heath during the breeding season to avoid disturbance to ground nesting birds. Large Lake with surrounding meadow and scrubland. Park at the end of Washfield Lane, Treeton, near the railway line. Follow path south along the edge of the Railway to reach Treeton Dyke. Former colliery yard and spoil heap of the Monkton Colliery . Car parks can be found along Lund Hill Lane, East of Royston. 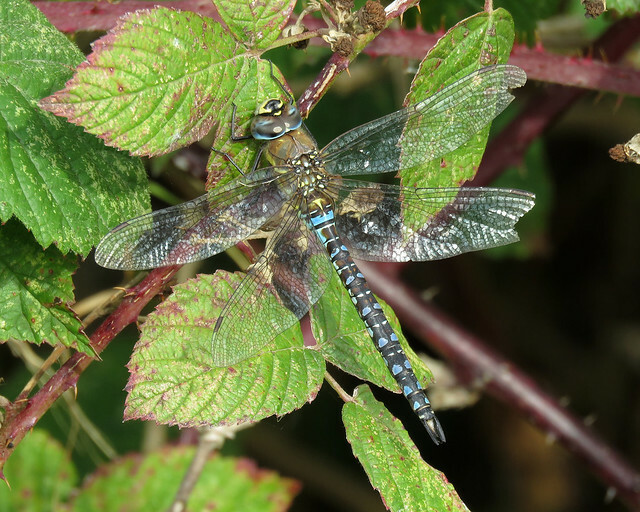 A dozen large-scale nature areas have recently been unveiled by the Government as part of efforts to boost wildlife, help rare species and restore habitats. 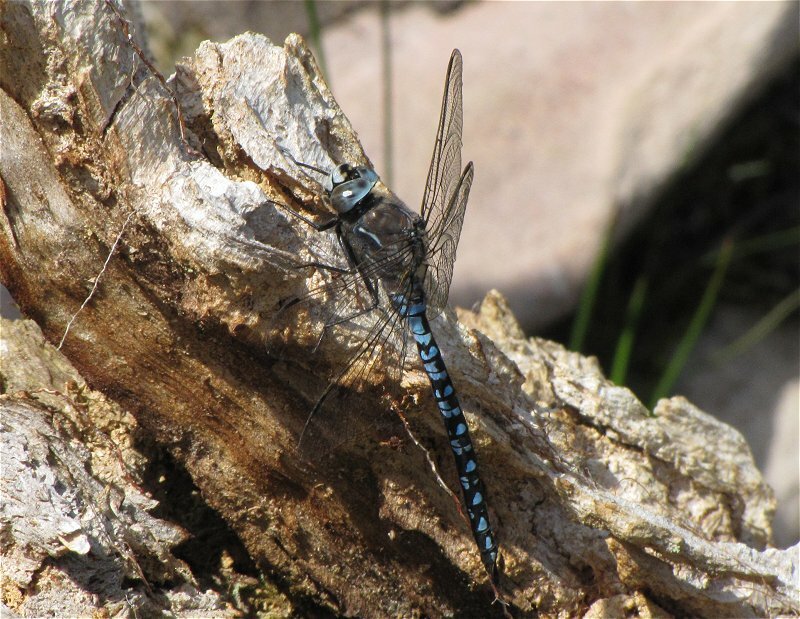 It is hoped the twelve areas, ranging from northern Devon to the Humberhead Levels, will restore wetlands, grasslands and peat bogs, improve rivers, plant trees and make new ponds.The “nature improvement areas” will share £7.5 million over three years in order to help local groups carry out work to improve, increase and link up networks of wildlife sites in their regions, in a bid to encourage threatened and declining species. Two of these areas are Yorkshire sites and they offer great opportunities to conserve and enhance the dragonfly fauna in our area. 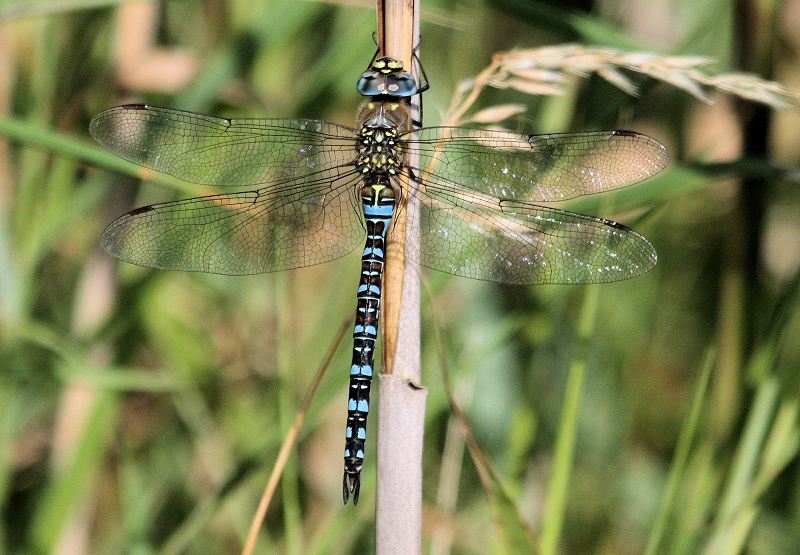 The Humberhead Levels Nature Improvement Area is part of the vast flatlands straddling the borders of Yorkshire, Lincolnshire and Nottinghamshire and offers the best opportunity in England to develop a major multi-functional wetland landscape in a largely unrecognised biodiversity hotspot. The NIA covers 49,700 hectares and will be administered and driven by the Humberhead Levels Partnership and its main aim is to create an internationally renowned, unique wetland landscape, supporting thriving communities, economy, ecosystem services and wildlife, enhancing existing internationally important wetlands (the Humber and the Humberhead Peatlands), other SSSIs and Local Wildlife Sites and includes the Broomfleet Washlands Project. 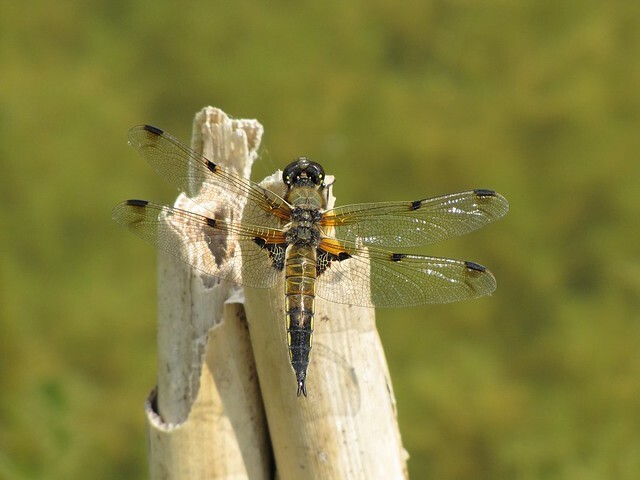 These sites will be reconnected by working with local farmers to create ribbons of habitat on unproductive drain-sides, headlands and wet field corners associated with the important rivers and dykes that traverse the area. Wildlife will be free to move through adjacent farmland, the land’s economic value will be maintained and its resilience to climate change increased. 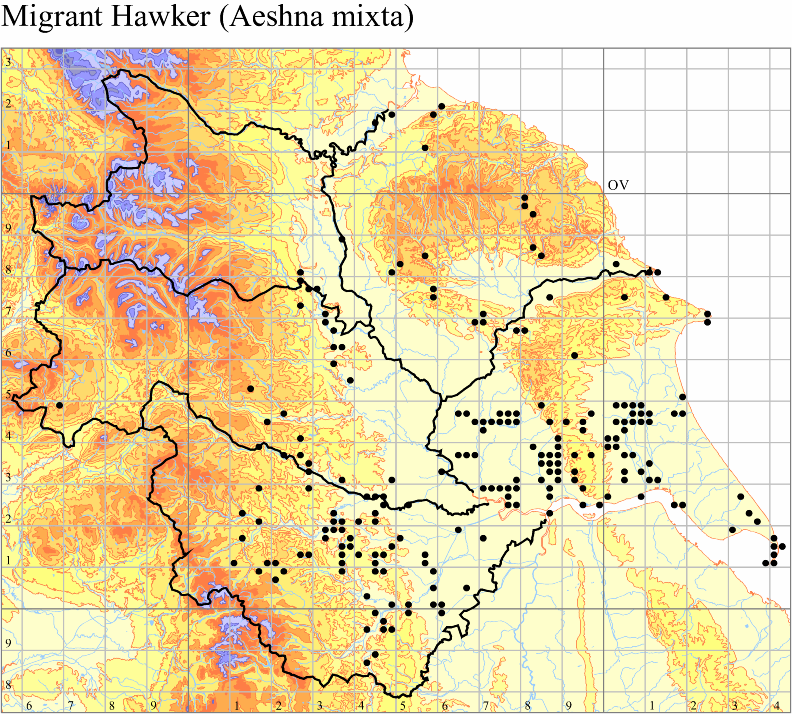 This programme will create or restore at least 1427Ha of wetland habitat. 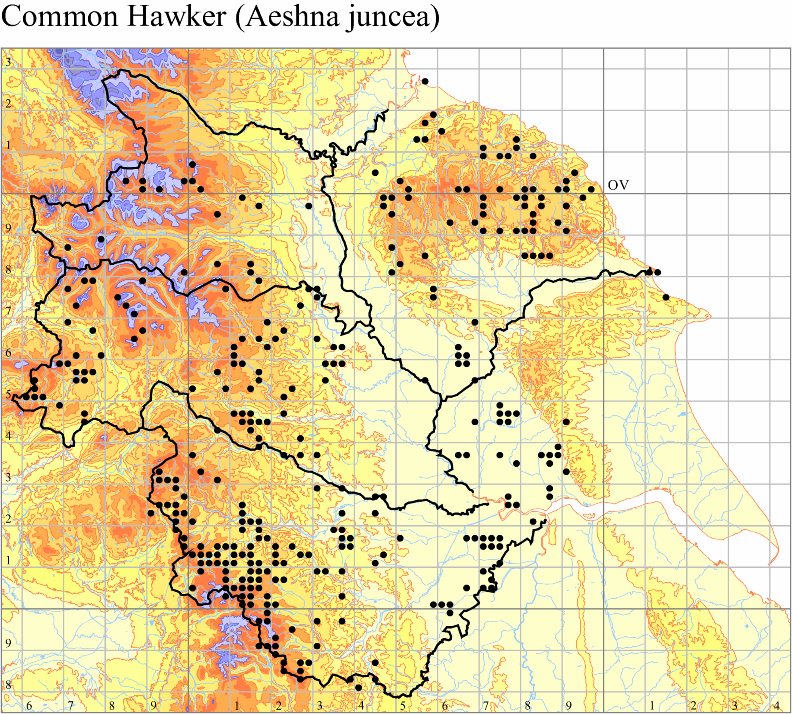 A key aspect will be progress towards reinstatement of England’s largest lowland mire system. Success here will increase the amount of carbon sequestered into newly forming peat and wetland soils; a vital ecosystem service. 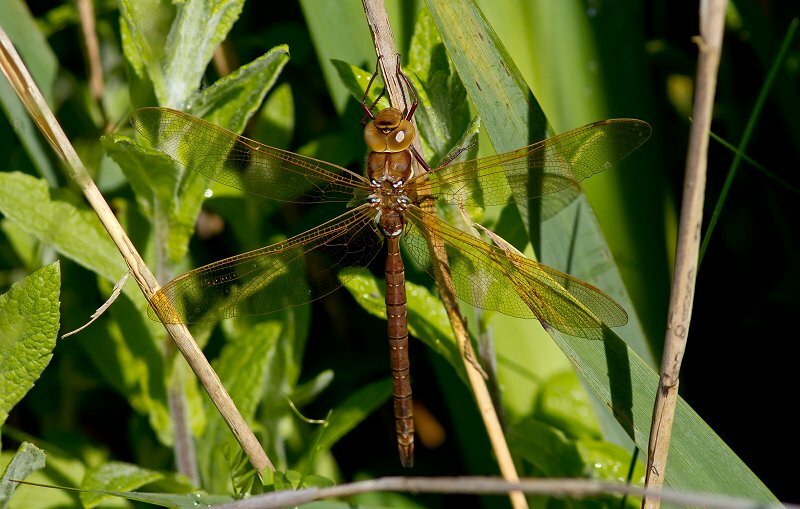 The Humberhead Levels NIA will develop community capacity to get involved with wildlife sites. This will operate in three distinct ways; i) improved interpretation and face to face contact on five sites with existing visitor infrastructure will encourage an extra 6000 visits to local wildlife sites over the next three years, ii) new environmental education programmes will operate from three different sites in the area and; iii) targeted volunteer development and training will deliver an extra 3910 hours of volunteer input. Better integrated land use will make the area more resilient to climate change. Closer partnership working will align farming with more sustainable flood defence, water supply and biodiversity conservation. The impetus provided to the local green economy through, for example, our work on biomass to energy projects, could provide new jobs and sustainable development opportunities in an area of multiple deprivation within 10 years. This could increase work for conservation management contractors and for green tourism employees from cafe staff to nature guides. Connecting local communities to their wildlife sites will increase independence from central government funding and increase local pride and stewardship, foster social wellbeing and provide significant health benefits. 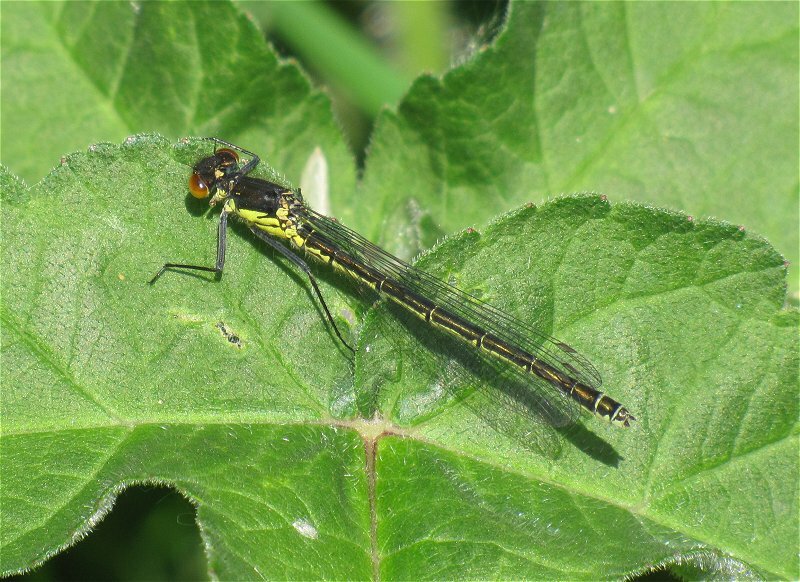 The Dearne Valley Green Heart Nature Improvement Area will help local people deliver their vision to restore the ecological functionality of the river Dearne, its floodplain and its link to habitats on surrounding sandstone and limestone hills. 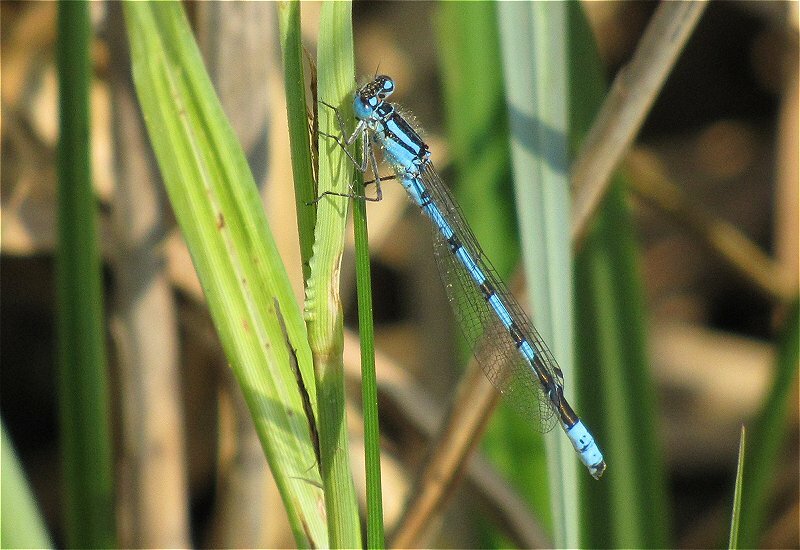 The vision is to create a 1300ha core of wetland and woodland habitats which will be buffered by 2690ha of open land and reclaimed industrial areas whose biodiversity areas will be enhanced. This will link up core areas and target farmland areas of poor ecological functionality covering 1700ha.The restoration areas will cover 500ha of semi natural grasslands, new woodlands and wetlands. It will also enhance 1150ha of farmland and 150ha or woodland areas through targeted advice in the poor ecologically functioning zones. A landowner and farmers working group has been set up to increase farmer involvement in the project.There will also be an extensive community outreach programme through the “Hidden Gems of the Dearne“ project. You may be at risk from Lyme Disease when you visit the countryside. Lyme Disease is a relatively uncommon infection in the UK but it has recently started to occur more frequently. It is caused by a bacterium carried by ticks. People who walk in the countryside, especially those walking through grass, rough vegetation or wild areas such as heathland, are more at risk. 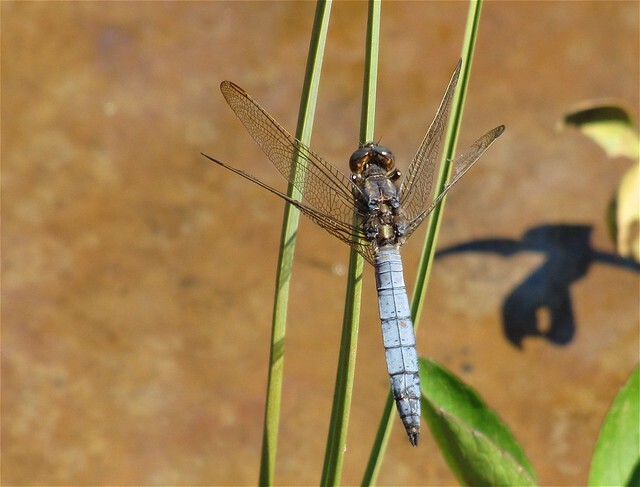 The Killer Shrimp Dikerogammarus villosus was found at Grafham Water in Cambridgeshire earlier this year, it has now been found at two sites in Wales. Below are some links giving further information with regards to the potential threat from this species. Currently people using the waterbodies containing the shrimp are being advised to clean any equipment used in the water thoroughly. 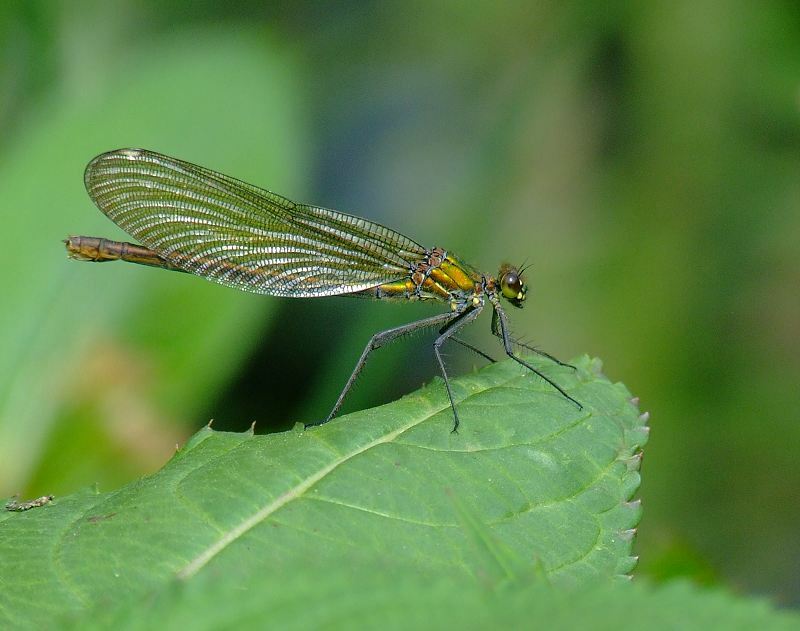 Claire Install, Conservation Officer for the BDS, recently attended a meeting, where someone described the situation at Grafham, it sounded like the water was (or is) teeming with the shrimp. 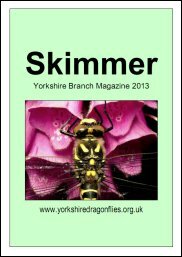 The link below is for an identification guide for the Killer Shrimp, it has been produced by the Freshwater Biological Association. The link below will take you to the non-native species secretariat webpage about the shrimp, it will give you some further information if you need any. 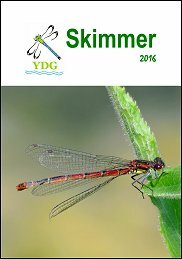 Keith Gittens (VC62 Recorder) has had an article published in the MOD’s Sanctuary Magazine covering the dragonflies of Strensall Common. 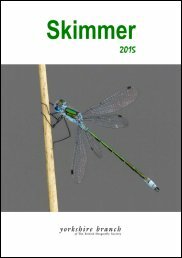 Sanctuary is an annual publication about conservation of the nature and historic environment on the Defence Estate. The most recent issues of this publication can be downloaded from the link below. Keith’s article appears in Issue 39 part 1. Wooded river valley of the Derwent. Park at the Old Man’s Mouth Picnic area SE984870. 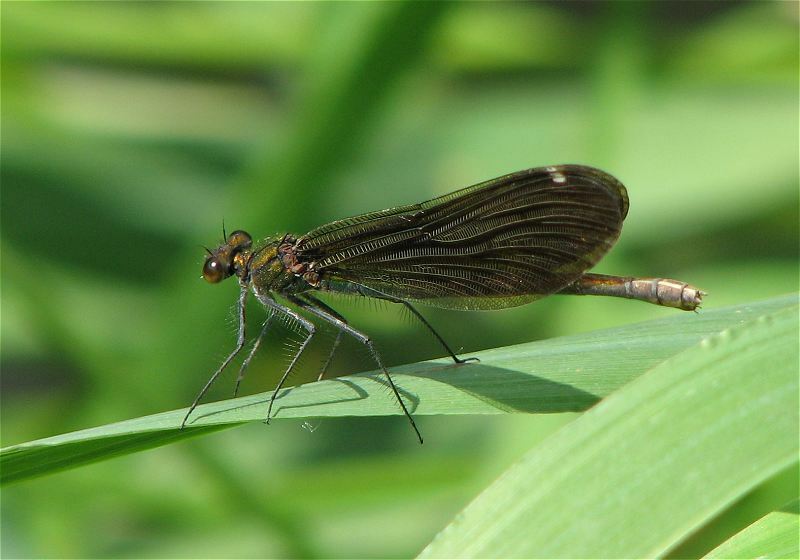 Cross the river on the board walk and walk upstream keeping an eye out for the demoiselles in sunny spots along the river. A former colliery site with ponds, grassland and a good path network. In 2008 it was designated a Local Nature Reserve. Numerous small ponds and disused canal. Car park off Shay Lane, between Walton and Crofton on the B6378. A 250 acre site which was previously an open cast mine, as well as a sand and gravel quarry and was turned into a country park in 1985. The park has two lakes, the largest of which is a 100 acre watersports lake. The smaller of the two lakes is only 24 acres and is a nature reserve which is overlooked by 2 bird hides. There are also many other streams and waterways on the site. East from junction 38 of the M1. Entrance from the A636 and A6186 junction roundabout. 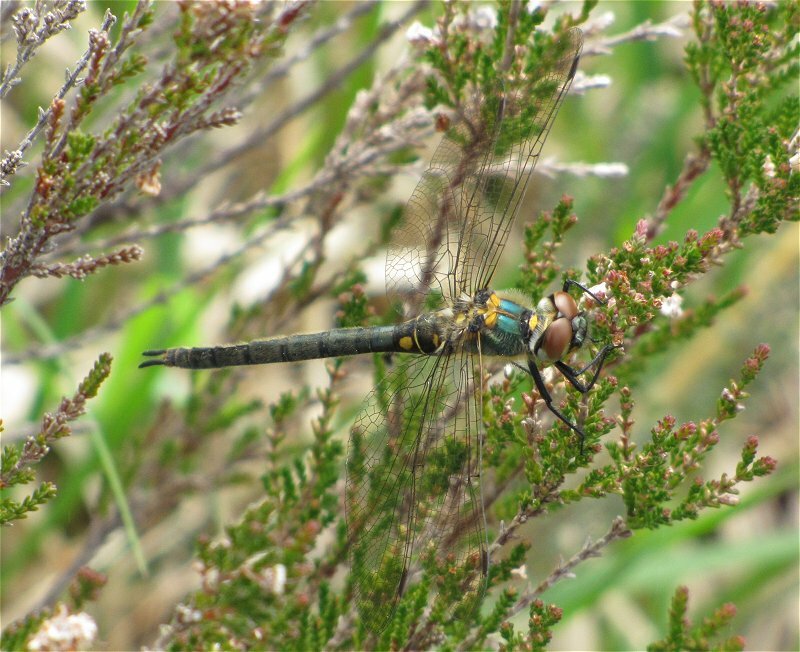 The East Riding of Yorkshire Council have opened up a public consultation for the East Riding of Yorkshire Biodiversity Action Plan. 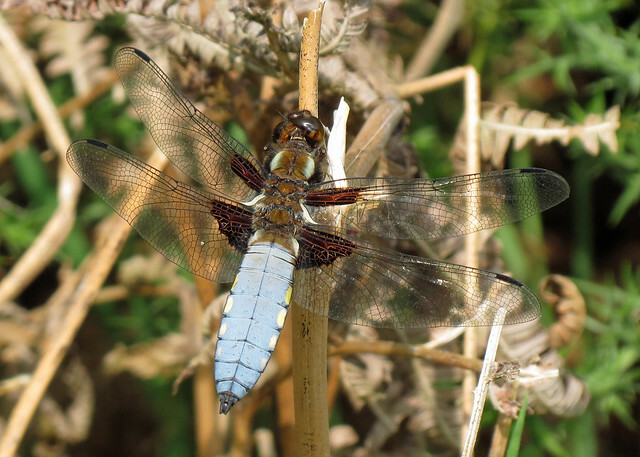 Paul Ashton – VC61 Recorder has represented the British Dragonfly Society as a partner to the plan. 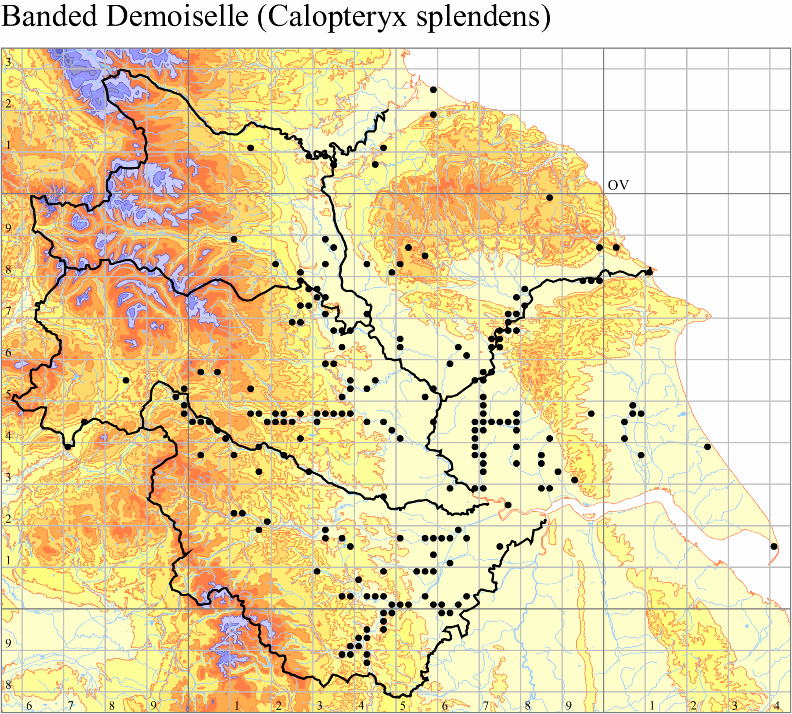 The following five species were submitted based on Local Importance, i.e. being recorded in less than 10% of all recorded tetrads. 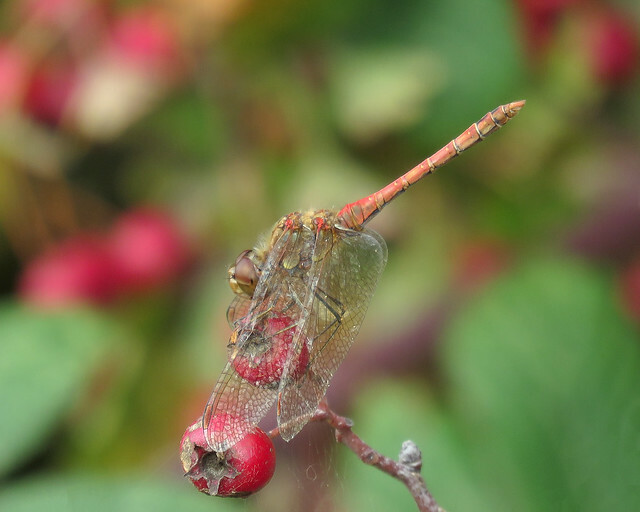 More information can be found on the East Riding of Yorkshire Council website at East Riding of Yorkshire Biodiversity Action Plan Consultation. A series of four artificial water bodies set within the grounds of the arboretum. 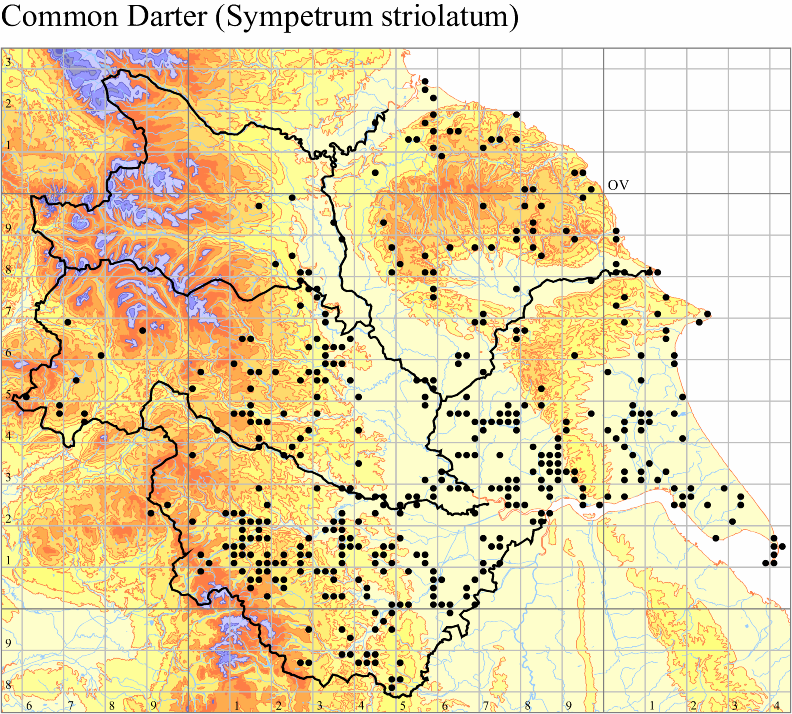 Situated between York and Malton, the arboretum is opposite the main entrance to Castle Howard. Remains of a small reservoir constructed in the 19th century for the lead industry. It’s surrounded by heather moor and rough grassland, at an altitude of aroud 380m. Hurst Dam is at NZ042023, in Swaledale just west of Hurst. It’s a little off the public right of way but on Open Access land, so it’s accessible at most times of the year, but not with a dog. 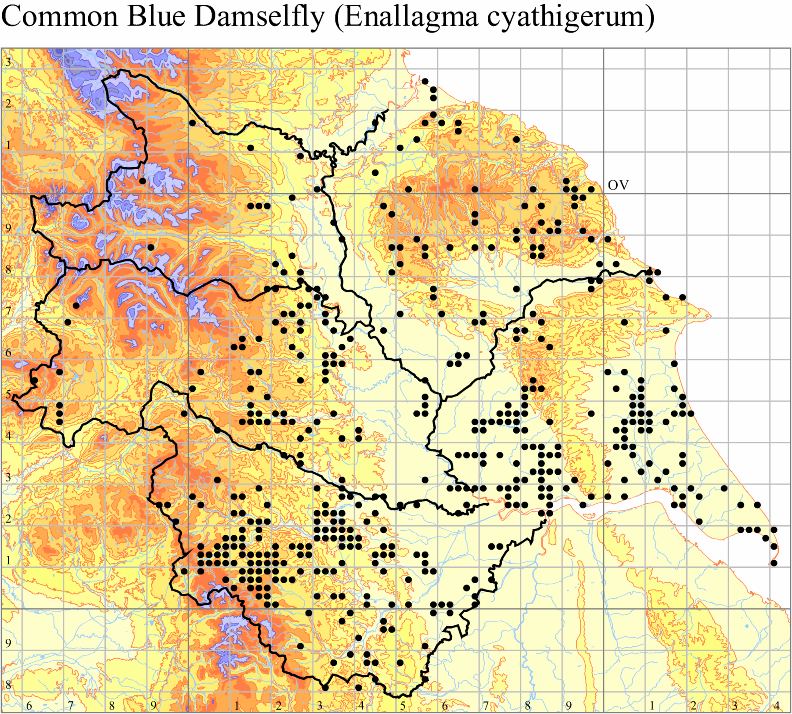 The Million Ponds Project will create an extensive network of new ponds across the UK. 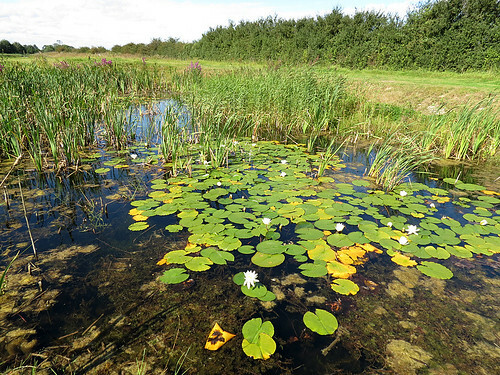 Ultimately the aim is to reverse a century of pond loss, ensuring that once again the UK has over one million countryside ponds. A critical element of the project is that these new ponds will have clean water. 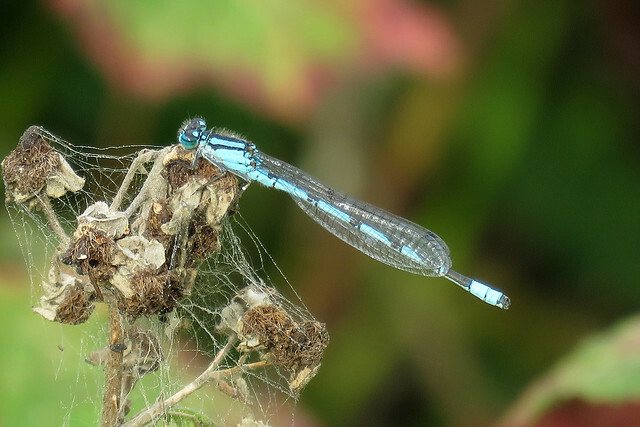 This is important because most countryside ponds are now badly damaged by pollution, and evidence shows that pond wildlife is declining across the UK. 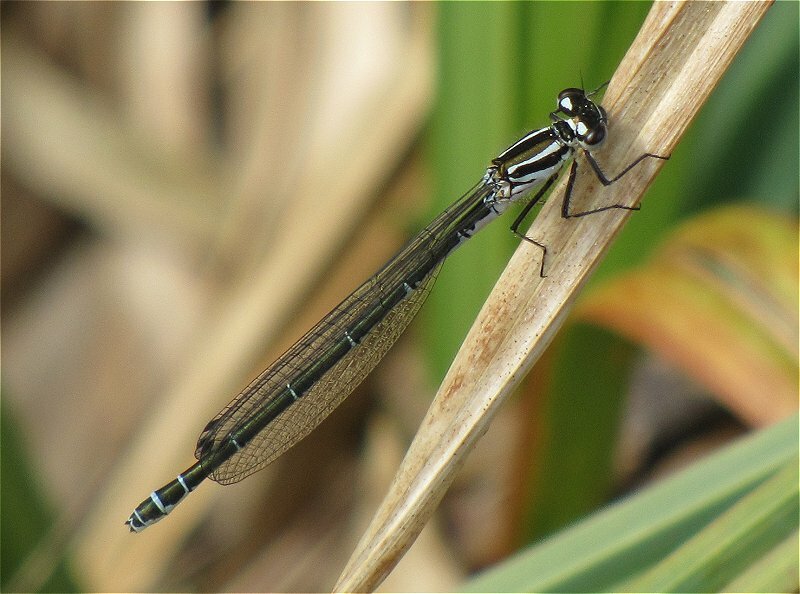 Making clean new ponds is one of the simplest and most effective ways to protect freshwater wildlife. 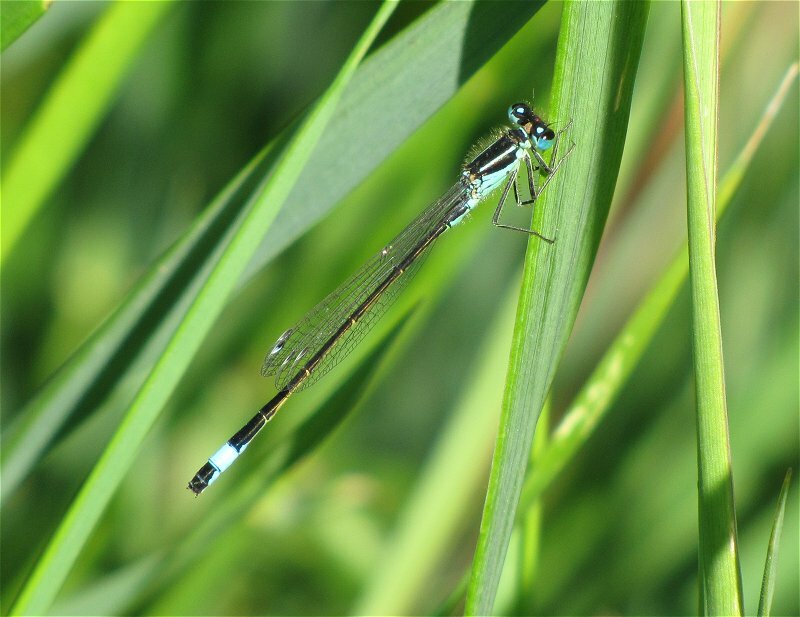 For more information visit Million Ponds Project on the Pond Conservation website. 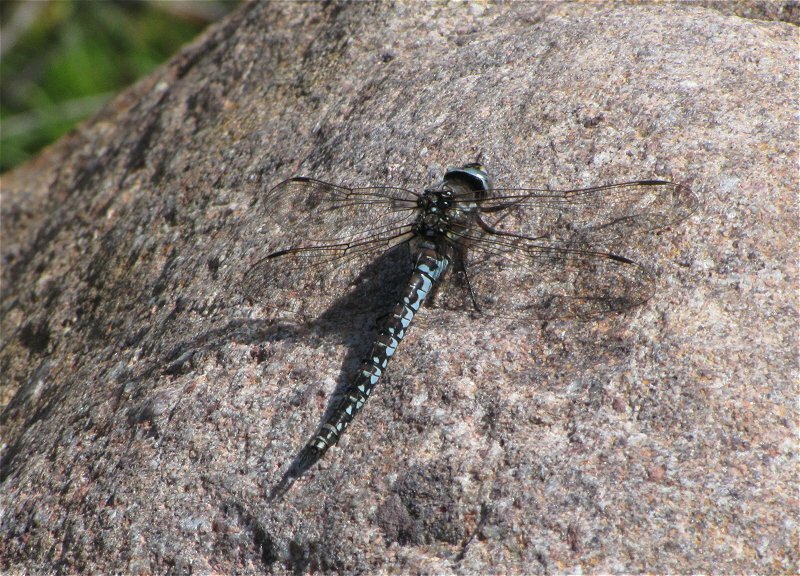 Dark brown-black wings, with iridescent blue veins making the wings appear metallic cobalt blue. Extreme tips and bases may be paler, there is no pterostigma. 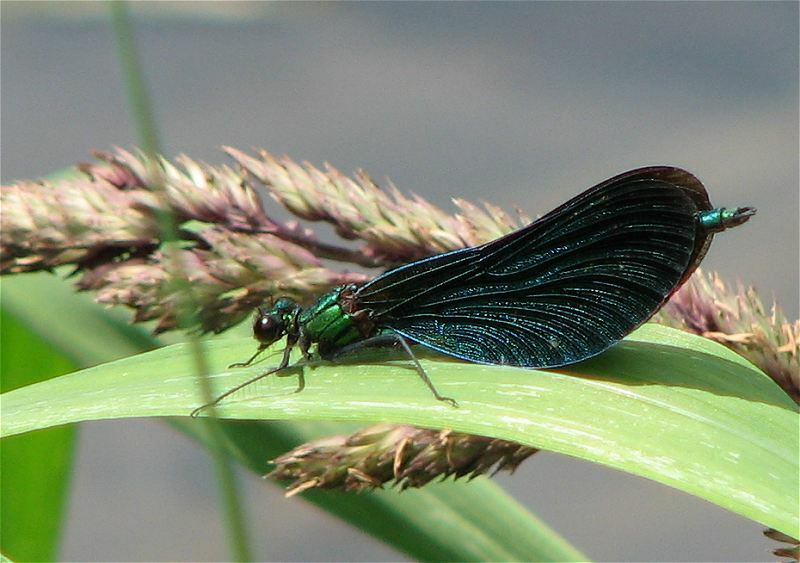 Wings are broader than the similar Banded Demoiselle. Body is metallic blue-green. 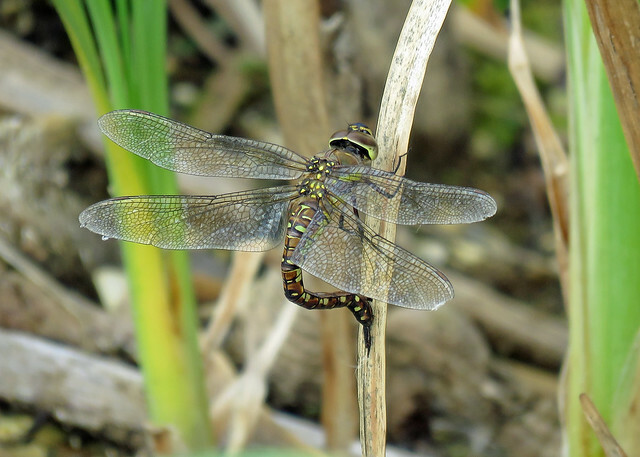 Immatures wings are browner. 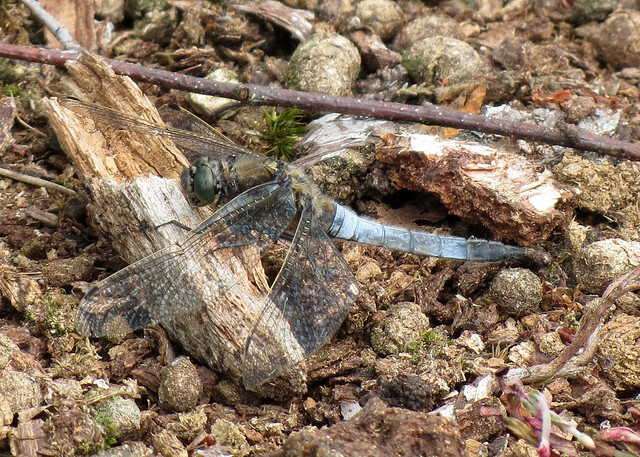 Dark brown iridescent wings with a white ‘false pterostigma’, larger on forewing than hindwing. 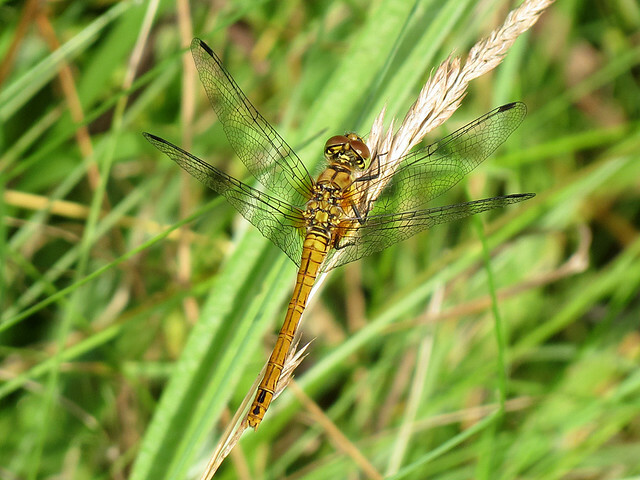 Wings are browner than the similar Banded Demoiselle. 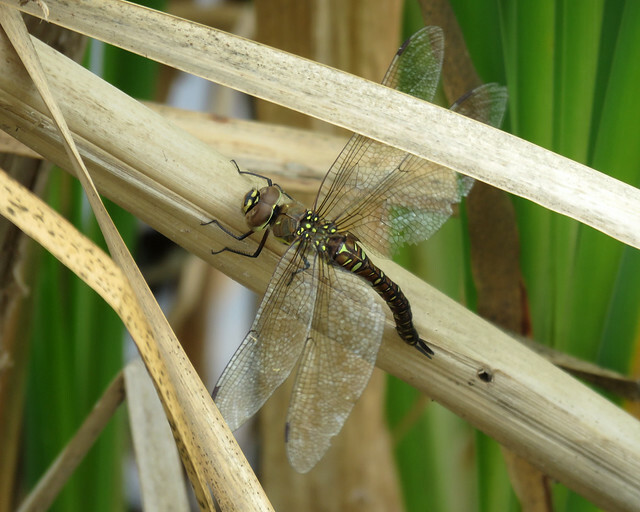 Body is metallic green with a bronze tip to abdomen. 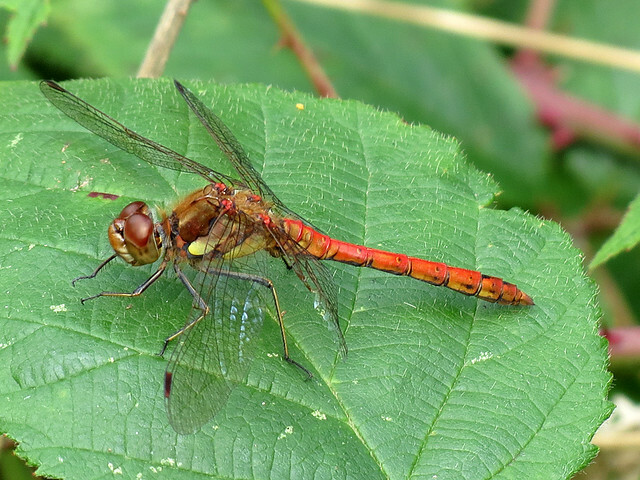 Homeochrome, (male coloured females) are sometimes recorded. 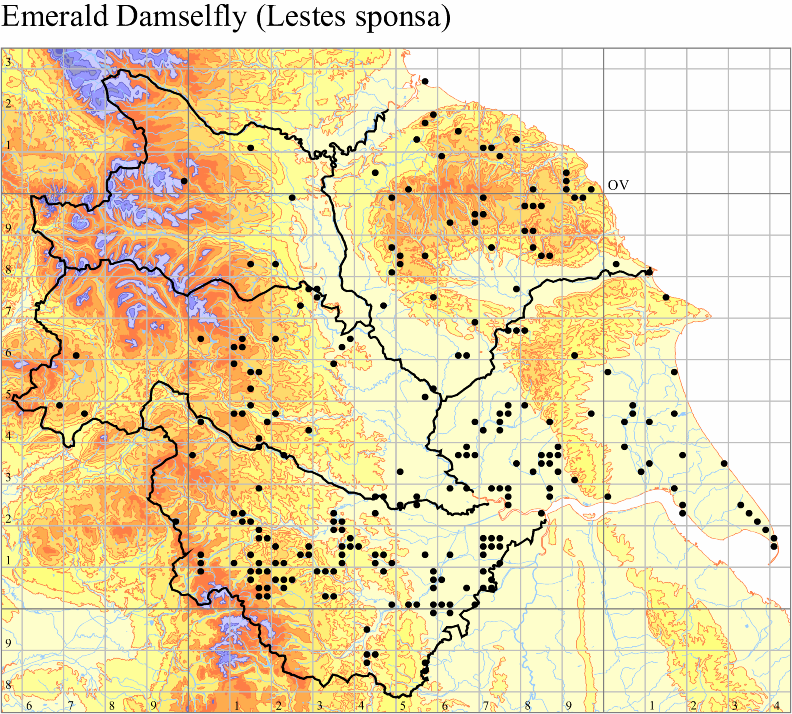 Territorial males perch on bankside vegetation. 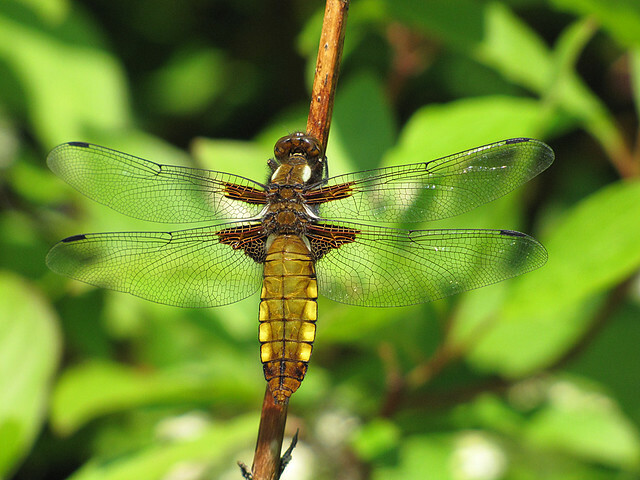 They will flick their wings open and shut, occasionally chasing off passing insects, often returning to same perch. 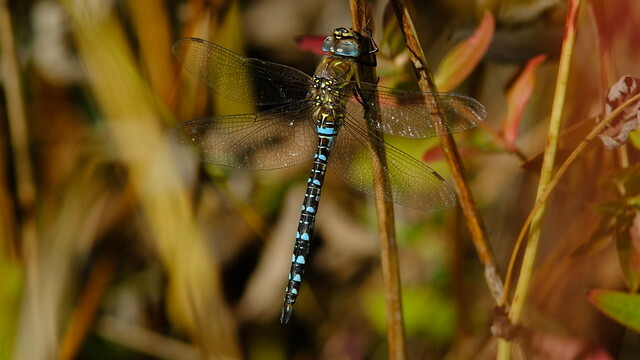 Females only visit water for egg-laying or seeking a mate, both sexes frequently stray well away from water. 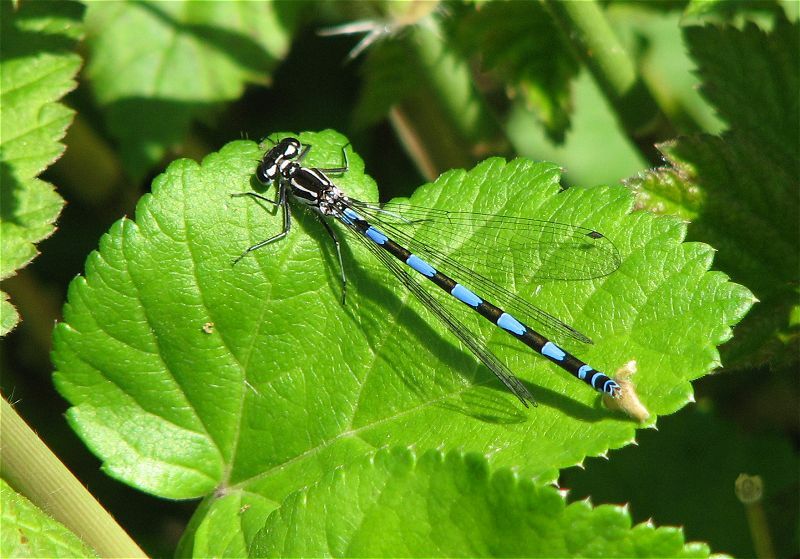 Flies slowly with a butterfly like flight and frequently settles on bankside vegetation or trees. Restricted to faster running clear water, found only along streams and rivers, often acidic, with sand or gravel bottom. 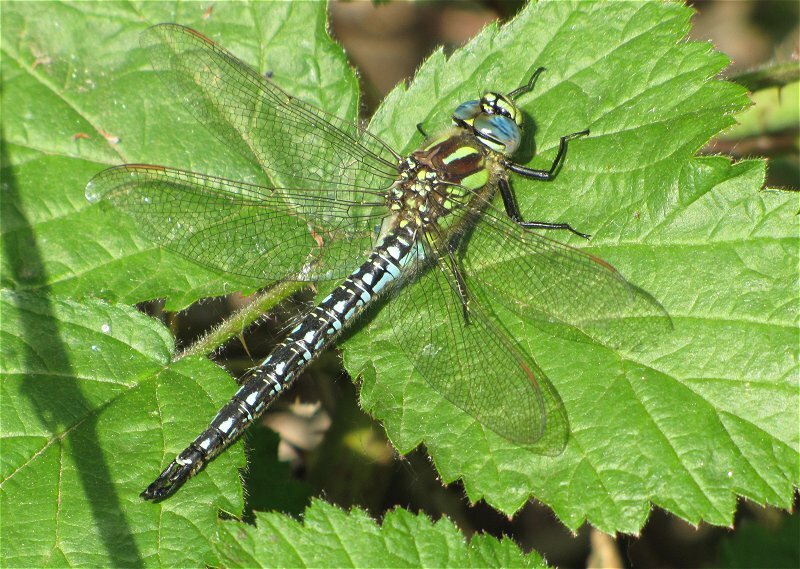 Mostly found along heathland or moorland streams, though can also occur in farmland and woodland, including well shaded streams. Prefers cooler water than Banded Demoiselle. 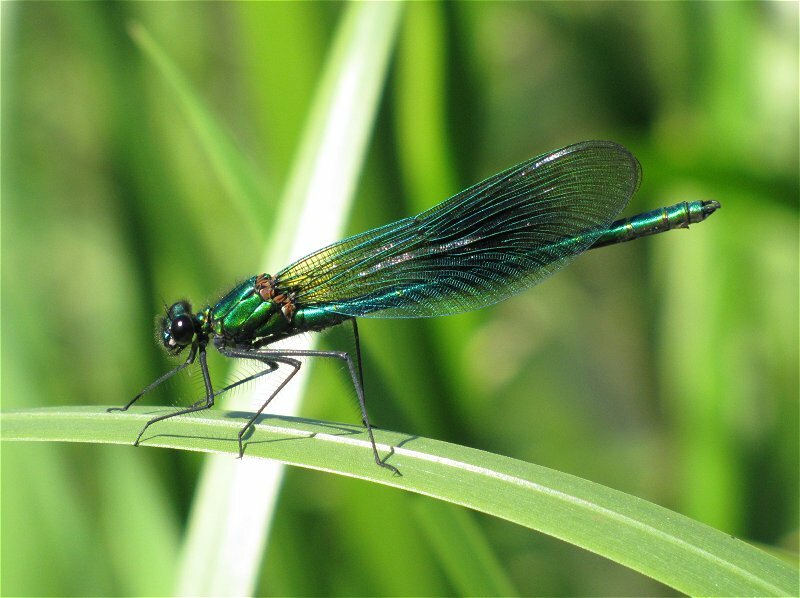 As streams broaden this species gives way to Banded Demoiselle, where there may be a broad overlap. Occasional hybridisation may take place. Sensitive to waterway management (clearance of vegetation) and pollution. National: Late April to early October, though generally May to late September, being most abundant during June and July. Yorkshire: Mid June to early August. VC61 – Only finds its way into the Vice-county due to the new course of the River Hertford being cut south of the old North and East Riding County Boundary. In many places this is within metres of the boundary. VC62 – Extremely localised to the south-eastern area of the North Yorkshire Moors. 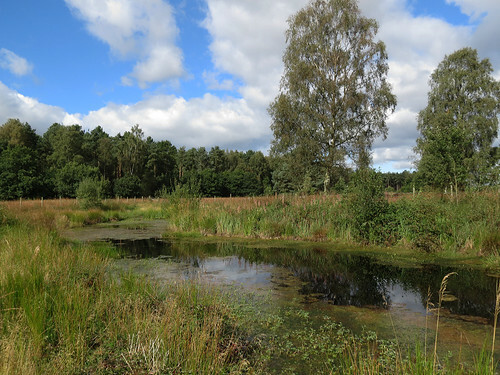 Over the winter period there has been some large scale work to drain parts of Skipwith Common. 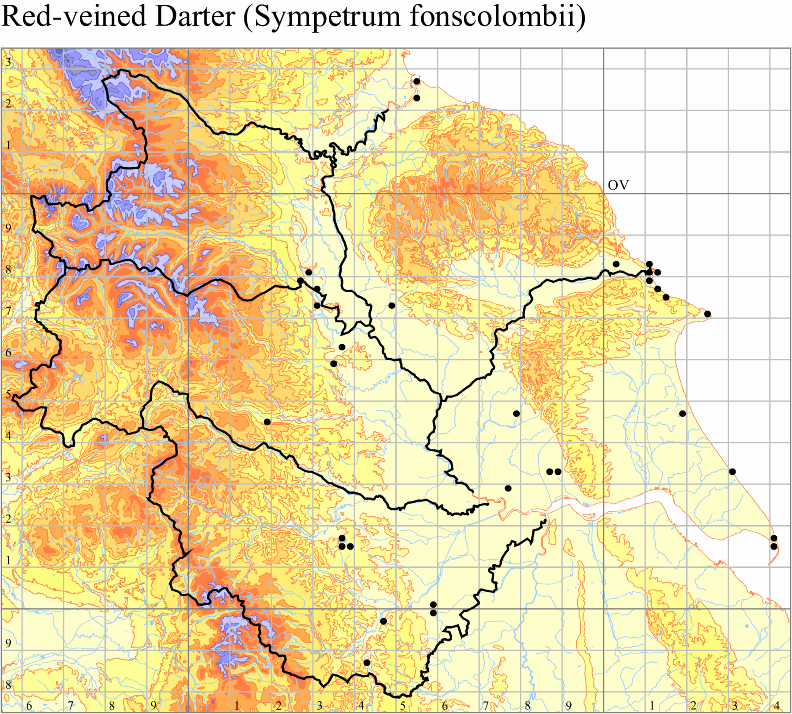 Over recent years mining subsidence has resulted in some areas of the common becoming flooded. These floods were the areas south of the road at the eastern end of the common and the central woodland area. 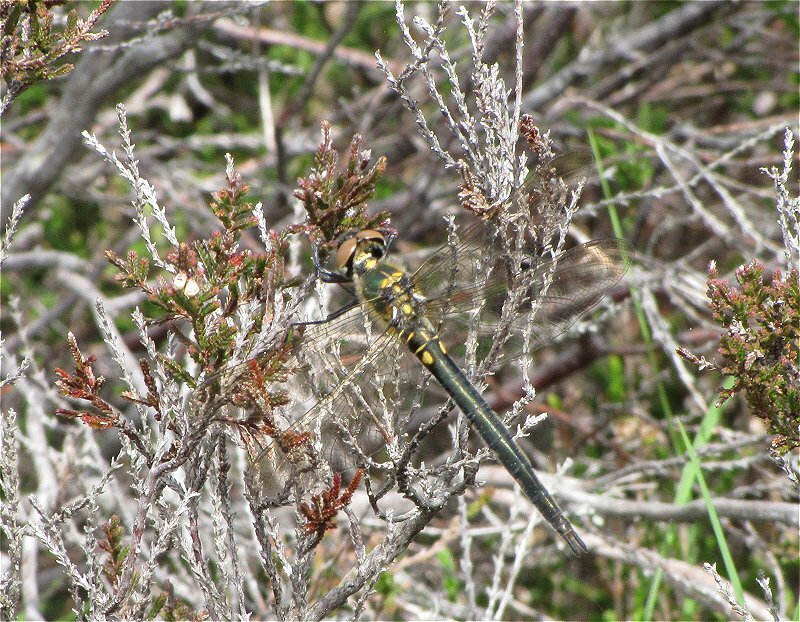 The work has been done to prevent further loss of the dry heathland. There are no plans to drain any of the historical ponds on the common. Hopefully the resulting drainage will not have an impact on the old ponds. 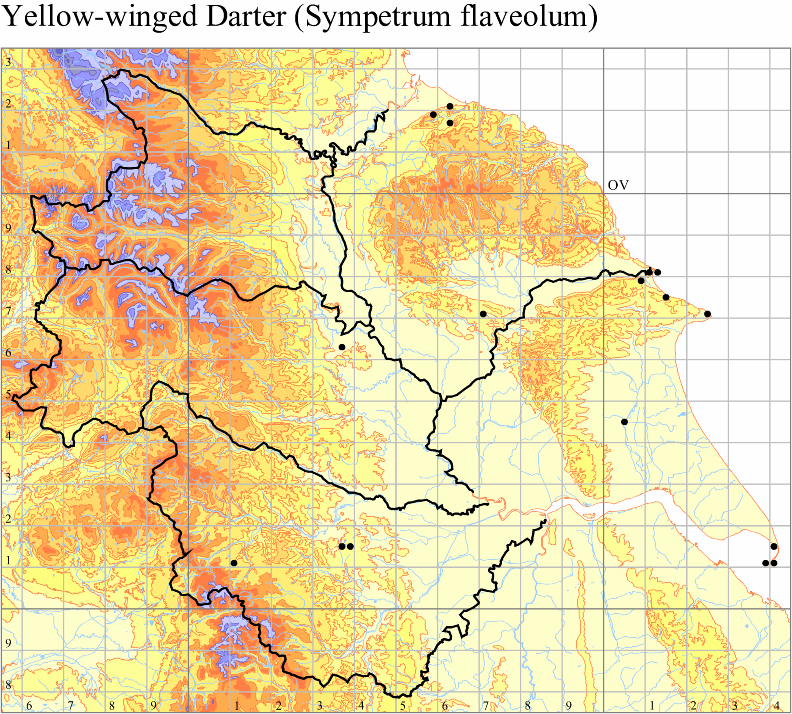 Woodland, shallow moorland streams, ponds and ditches. Access is of the minor road south of Blubberhouses. Parking for a couple of cars opposite Anchor Farm at grid ref: SE170542, or four cars along the unmade road at grid ref: SE166530. Range of open water and marsh. Visitors centre is 3/4 of a mile west of Fairburn village. 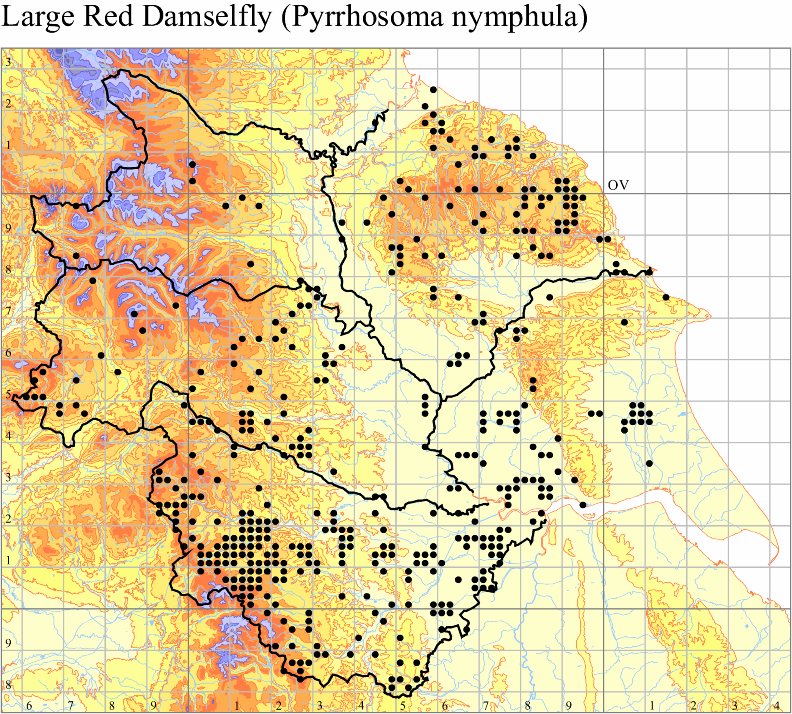 Range of open water, marsh and woodland. Located half a mile from Junction 3 of the M18, just south of Doncaster. Access into the reserve is via Sedum House, the head office of the BTCV. 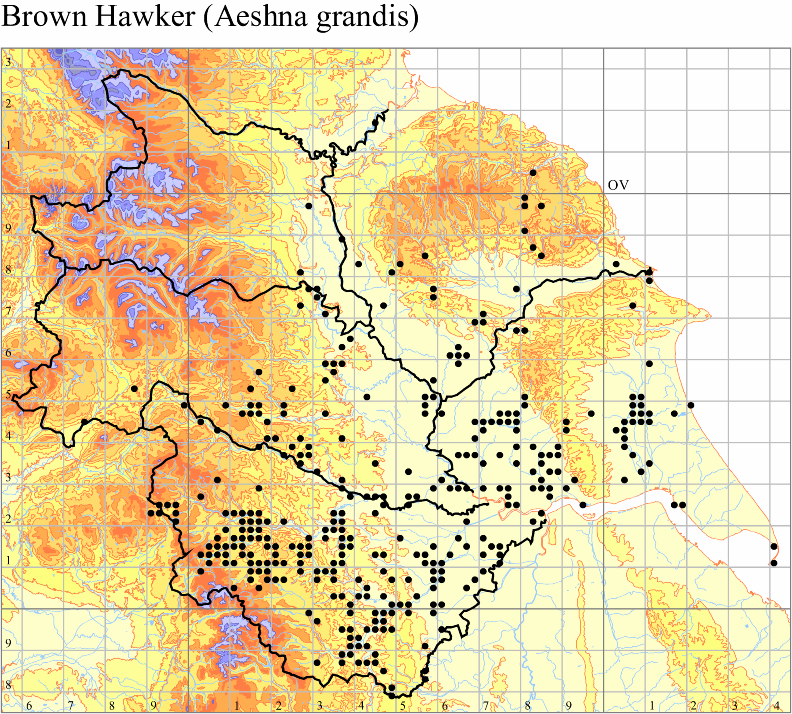 The reserve is situated to the west of the A169 Pickering-Whitby road, about ten miles north of Pickering and three miles south of Goathland. Shallow scrapes and former canal. Park in the Canal Scrape car park before the entrance to Spurn Point. Dry and wet heathland, mire bogs. From the west off the A19 along King Rudding Lane, the east from Common Lane in Skipwith. 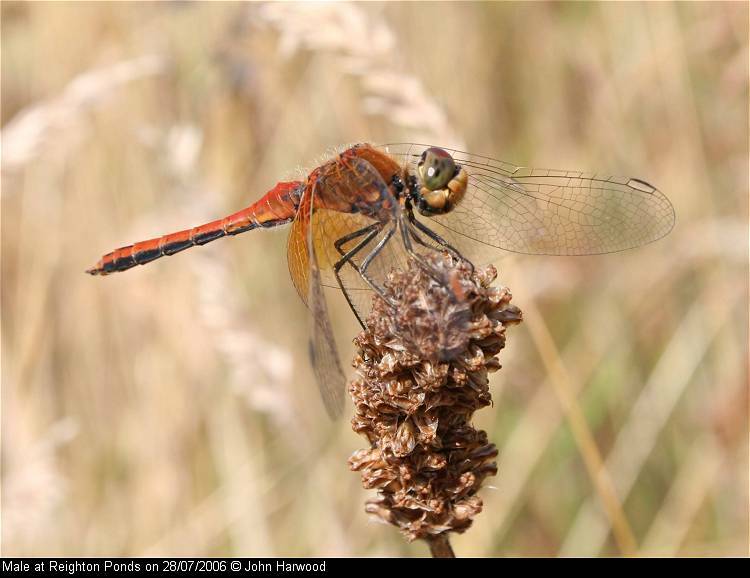 A Yorkshire Wildlife Trust Site – Open fresh water and reedbed. 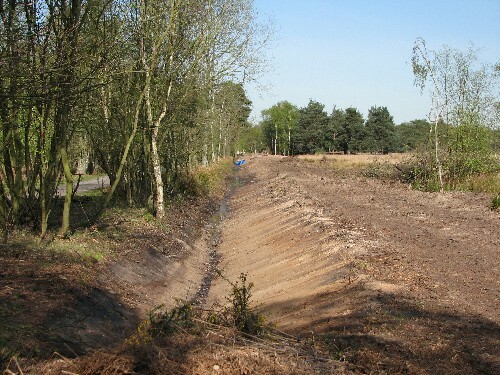 Borrow pit formed by extraction to strengthen the banks of the River Hull. From Beverley Road, Hull via Beresford Avenue (TA092322). Former site of sand and gravel extraction turned back to nature. 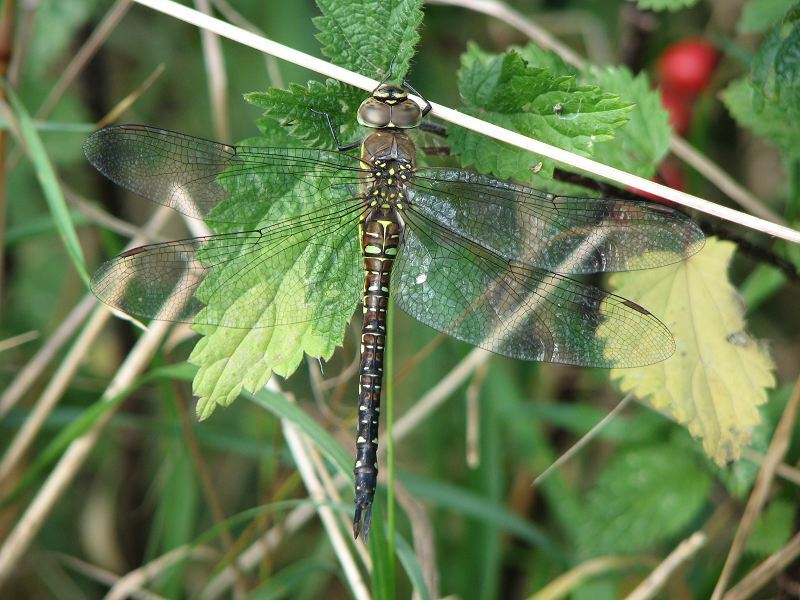 A Yorkshire Wildlife Trust Site – The site is still being developed, primarily for birds. 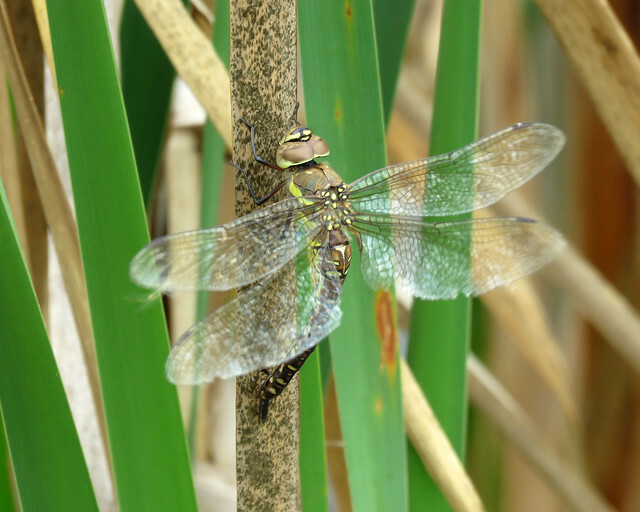 A series of five ponds have been created for dragonflies along the northern path of the reserve. Leave the M62 at junction 38. Reserve is signposted from North Cave village. Reserve is also signposted from the A1079 at Market Weighton. Canal and ponds complex with floating vegetation. A car park can be found along Canal Side West off the B1230 in Newport Village. Off the Beverley to Bridlington Road A1035 in Leven (TA1045). 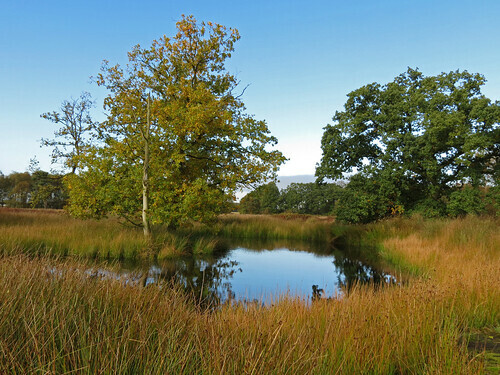 A Yorkshire Wildlife Trust site consisting of fresh marsh. Accessed via Wharfedale road off the A1039. Local Nature Reserve at (SE7829). The main pond is the former site of Eastrington Brick Works. There are several borrow pits foound along either side of the railtrail, the pits the result of building the former Hull and Barnsley Railway. There is a car park which is accessed off Howden Road, west of Eastrington village. 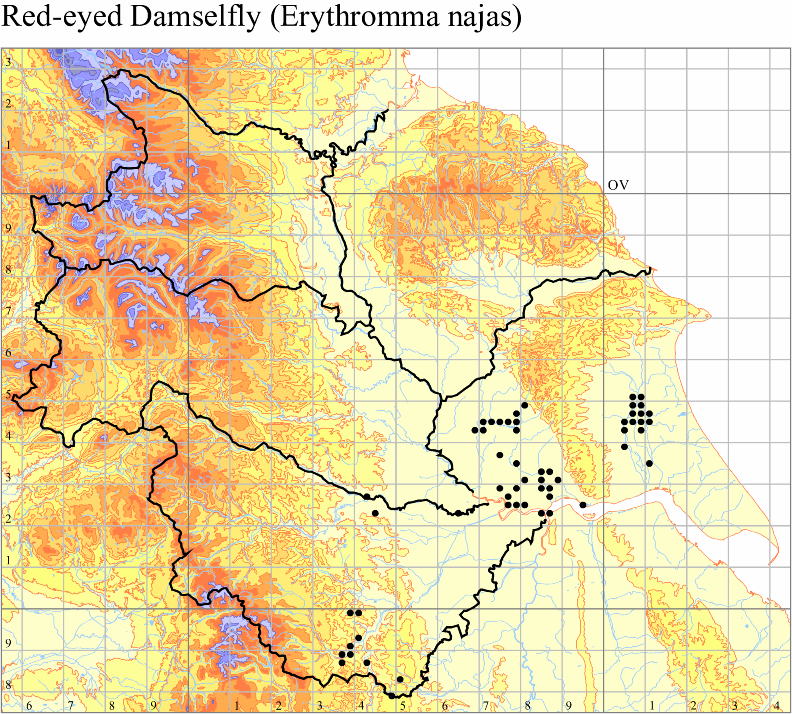 Fenland type habitat with a series of fishing ponds. Leave the M62 at the North Cave junction. Take the B1230 to Newport. Before reaching Newport take the left turning to Broomfleet along Wallingfen Lane. At the end of the road turn right on to Common Road. Continue straight on, the road eventually turns in to a deeply rutted track which is passable with care, car park can be found before the track rises towards the railway. Alternatively turn left off Common Road on to Carr Lane. At the end of the road turn right on to Main Street. 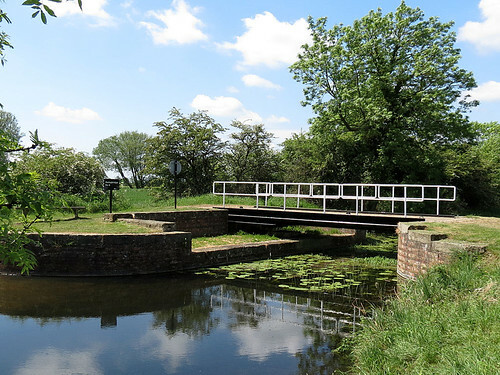 Take the right hand bend and follow the road until reaching the bridge over the Market Weighton Canal, don’t cross the bridge, the road is wide enough to safely park. Walk north towards the railway where there is an underpass on to the washlands complex. 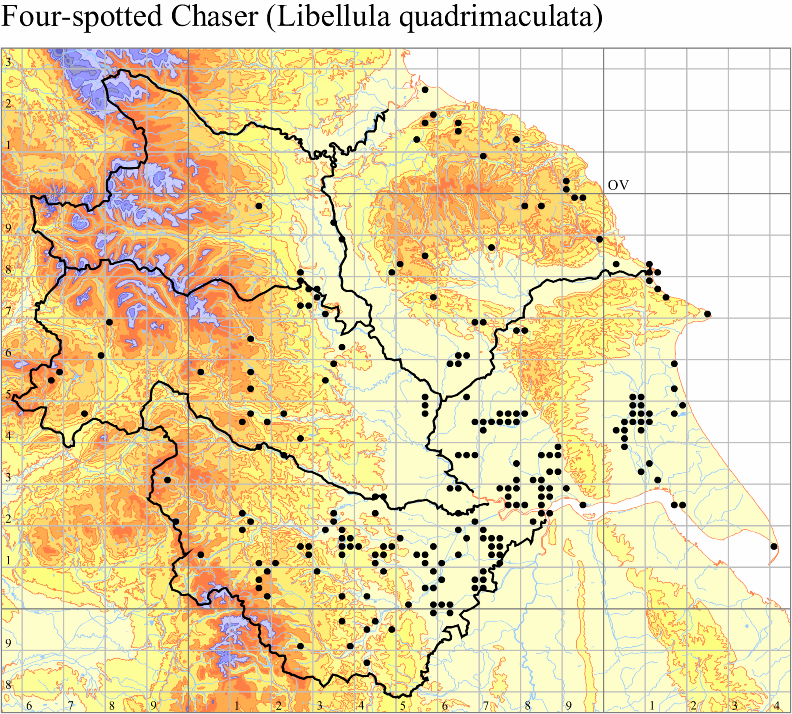 Note: The site may be used for cattle grazing and could also be in use for shooting. Metallic green in colour. 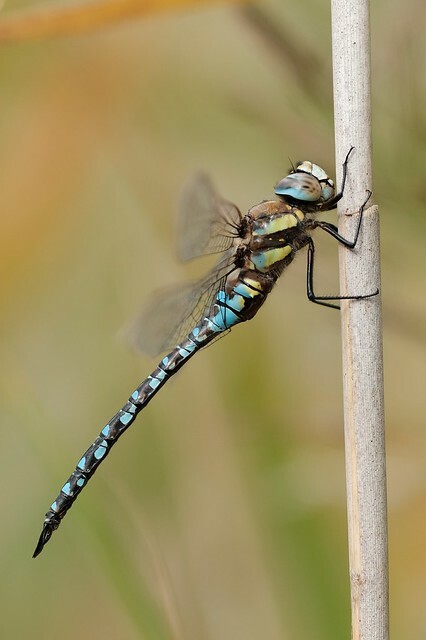 This species has a slow maturation period of two to four weeks, over this period a blue pruinescence appears on the thorax between wings and segments 1,2, 9 and 10. Eyes blue. 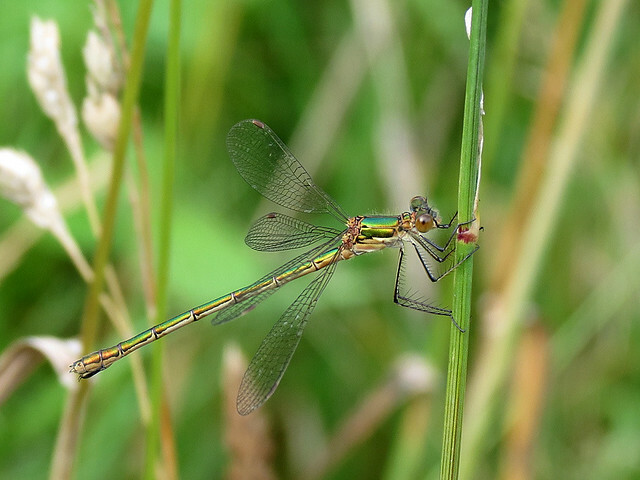 Confusion species is Scarce Emerald Damselfly which is extinct in Yorkshire. 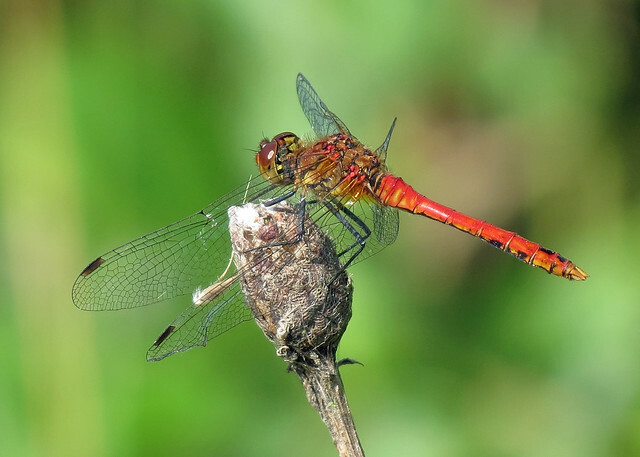 Both sexes rest with wings half open. 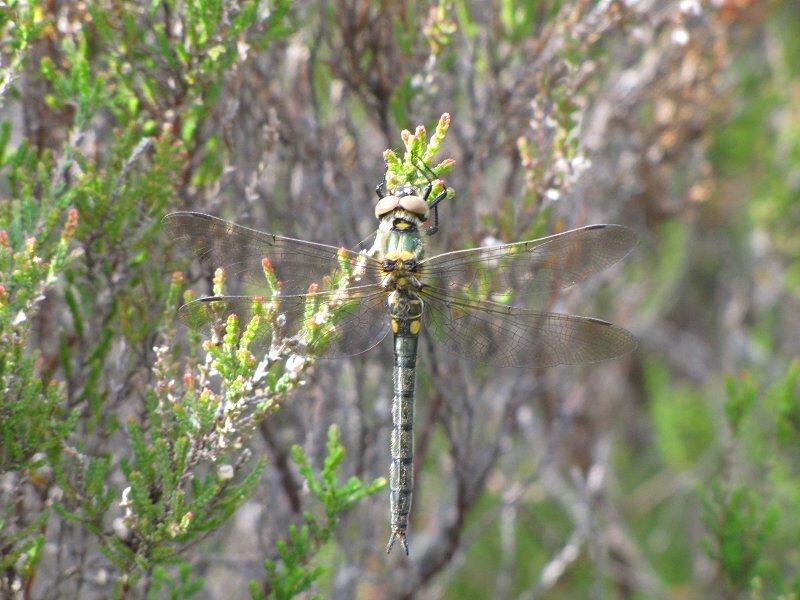 Metallic green, with pale beige sides to the thorax. Distinctly thicker abdomen than male. 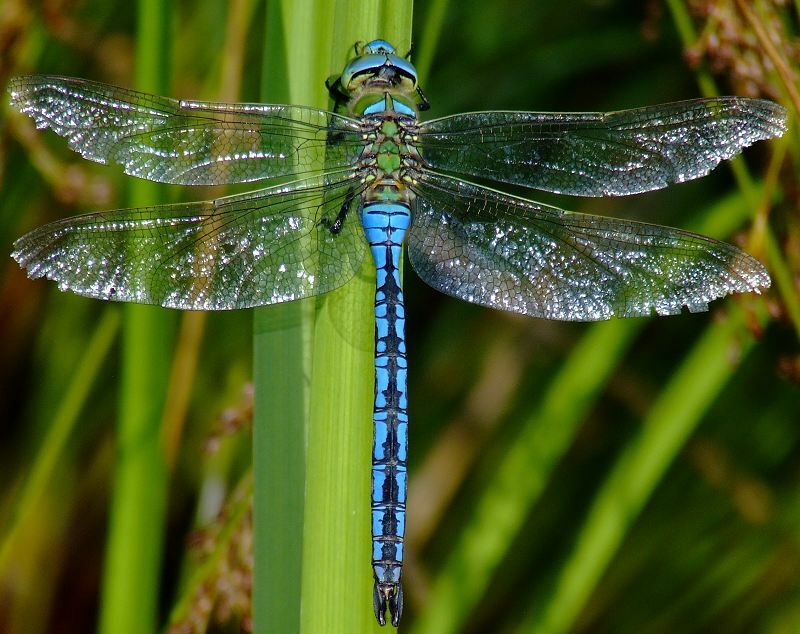 Weak flyer usually remaining close to emergent vegetation, rarely going far over water. 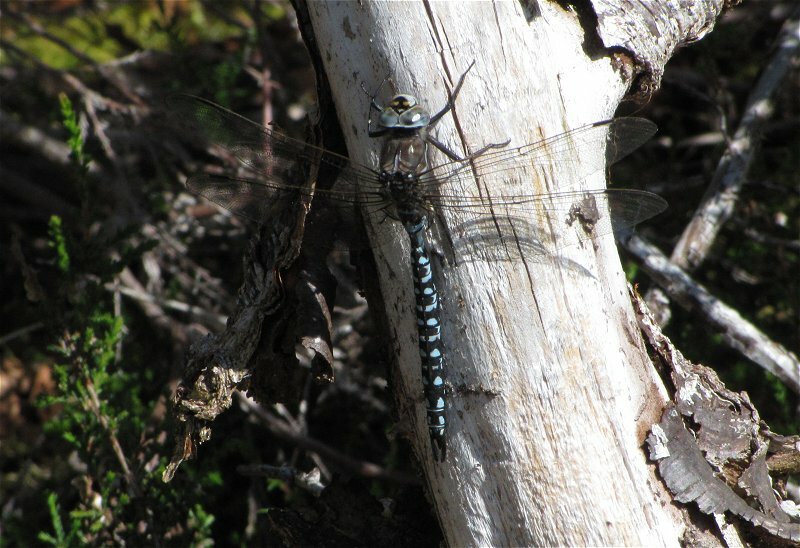 Copulation usually takes place close to breeding site and last from 30 minutes to over an hour. 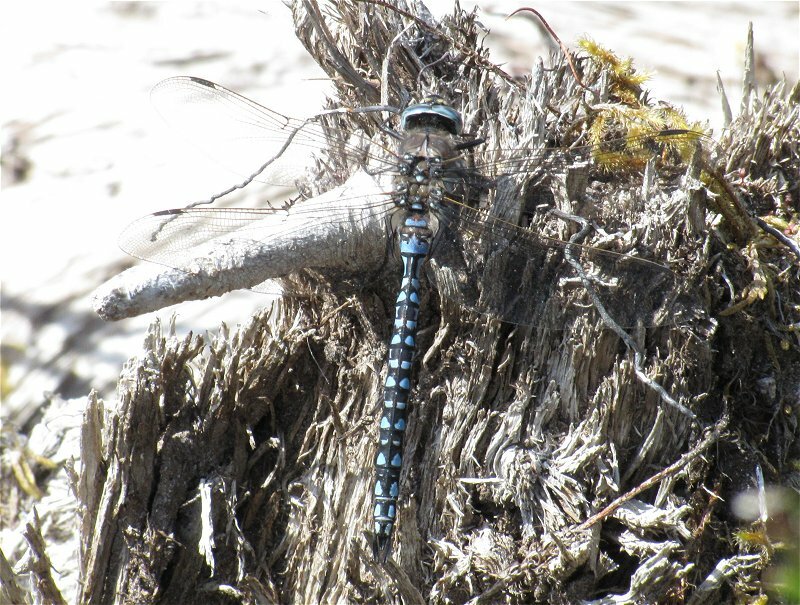 Females usually arrive to oviposit in tandem with the male. 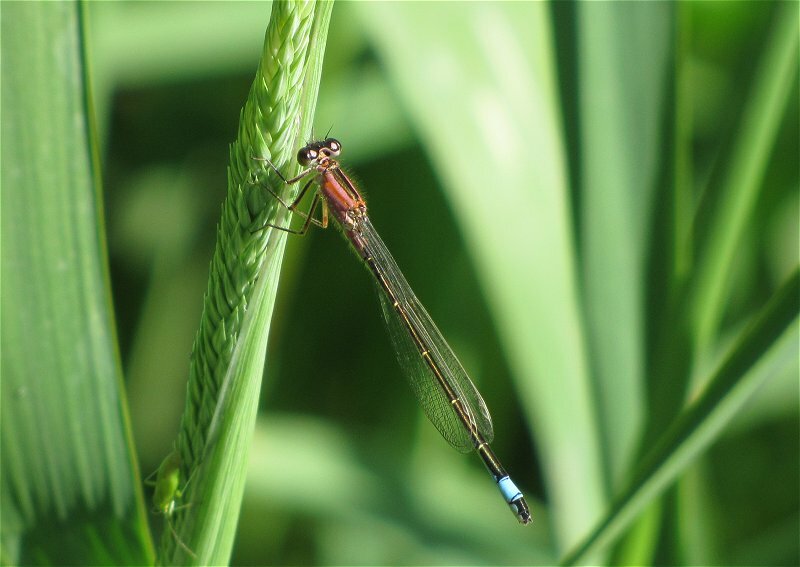 Oviposits in to stems of emergent grasses, rushes, sedges and horsetails, usually above surface, but can submerge, including the male. Fairly sedentary and can be absent from seemingly good sites. 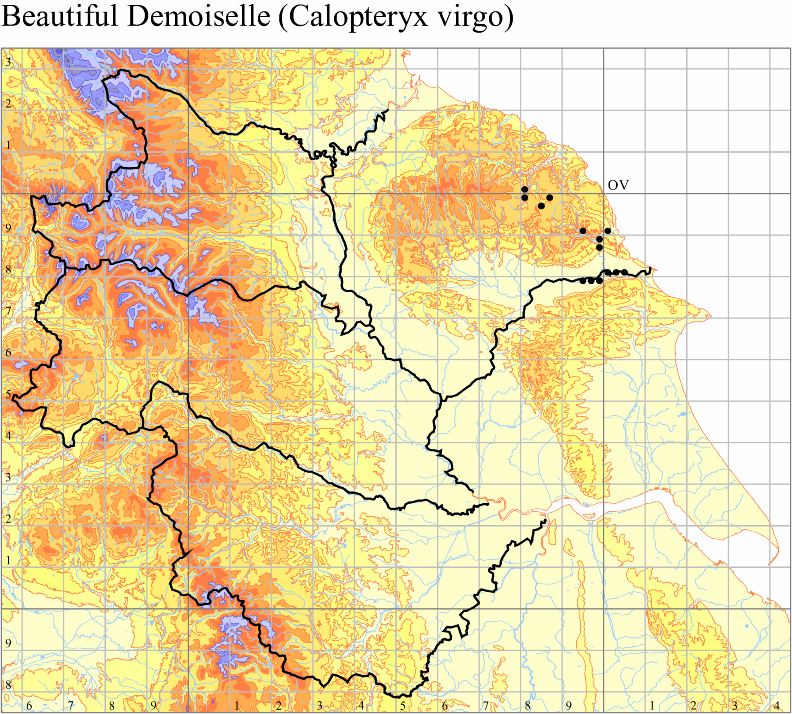 Still or slow moving water such as ponds, bogs, ditches, canals and lake edges with dense emergent vegetation. Tolerates brackish and acidic water. 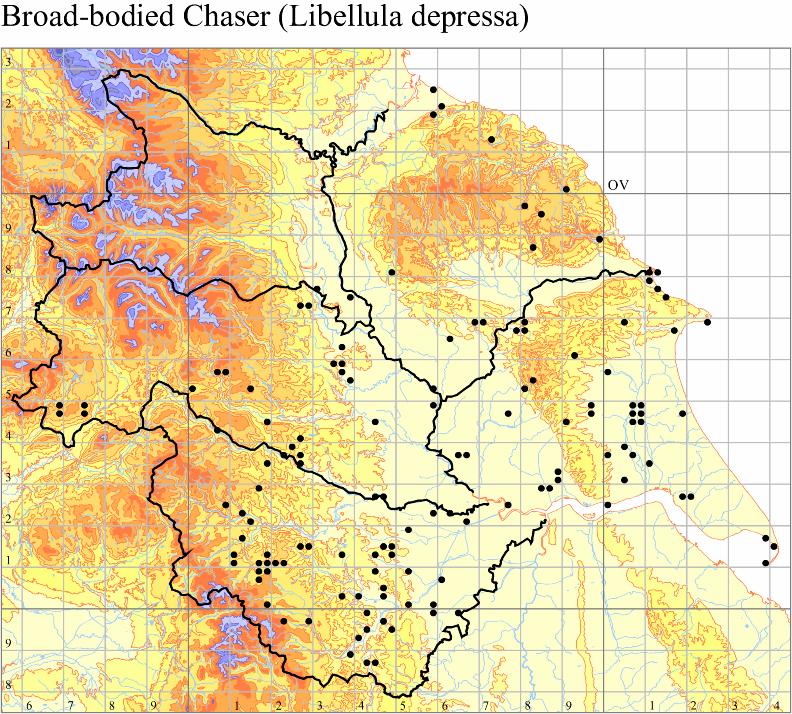 Sensitive to excessive clearance of emergent vegetation. Nationally: Late May to early October. Yorkshire: Late May, though more usually mid June to late September. 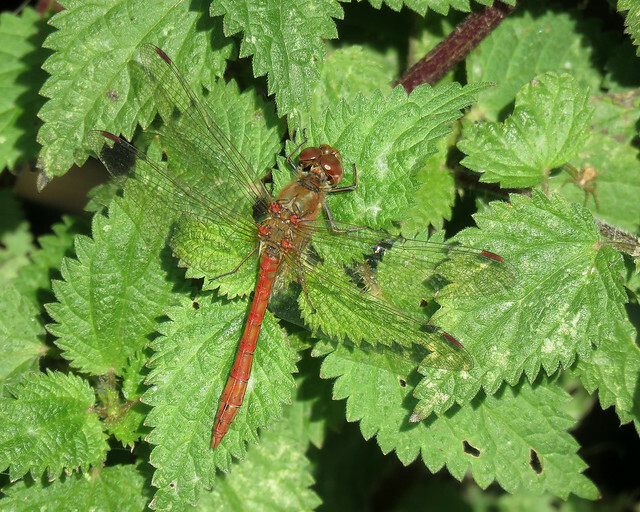 Most abundant during late July. Found at many sites through VC61-64. Scarce or under recorded in VC65. Only records concerns those from 1951/52 at Long Bank Dyke, Kilnsea. 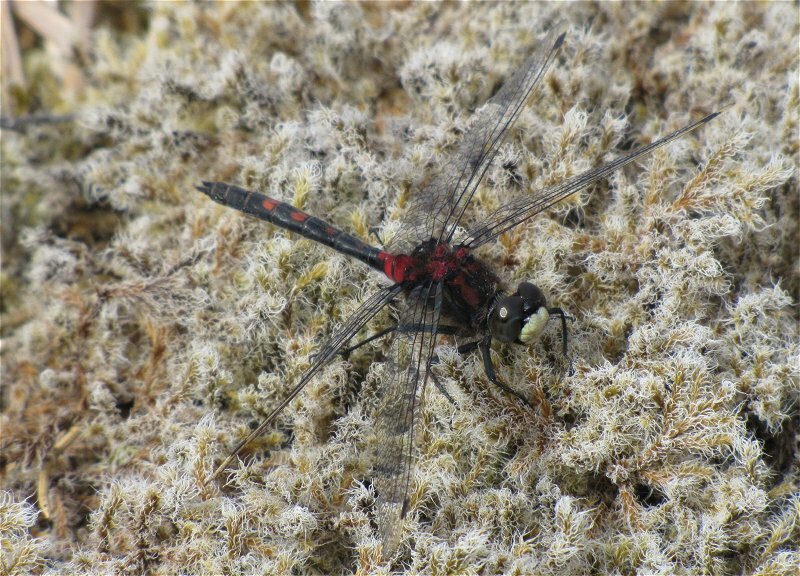 Mainly bronzed black with bright red eyes. Top of thorax lacking any antehumeral stripes. Segments 1, 9 and 10 are blue. 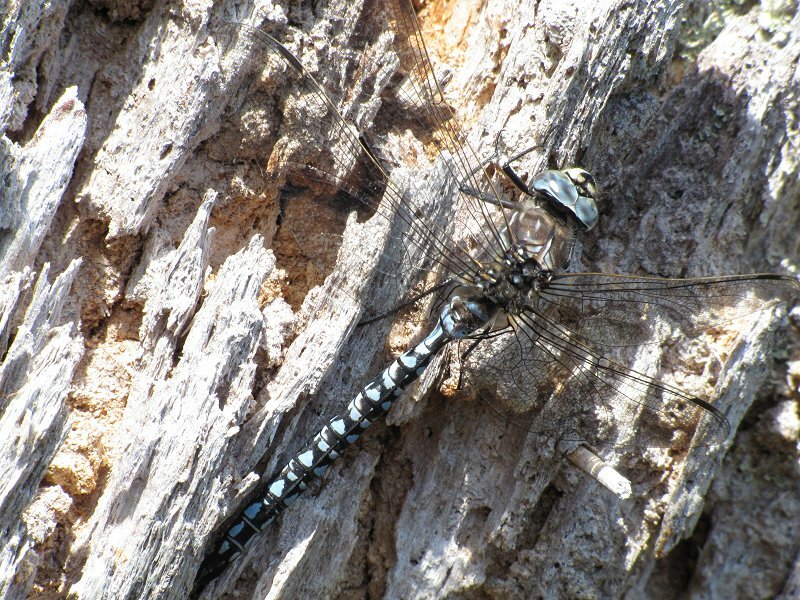 Sides of thorax are blue with black line and spur present. Legs are black. 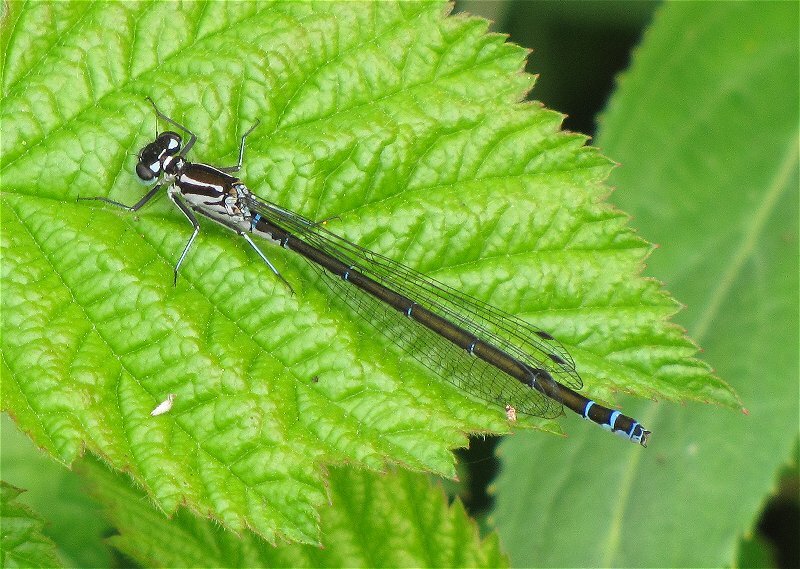 Immature male is similar to female. 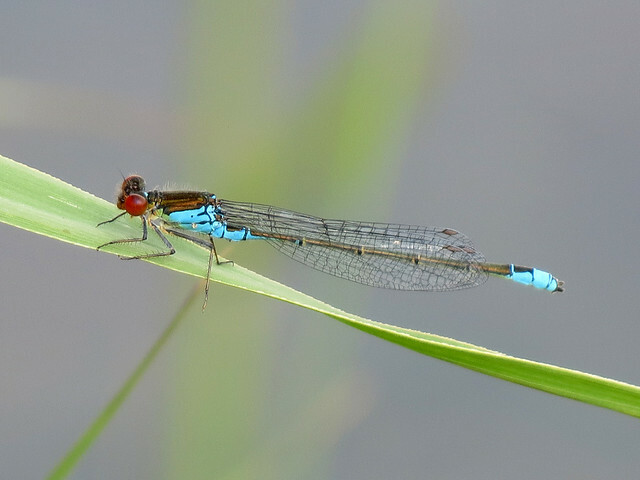 Similar to Small Red-eyed Damselfly which is smaller, differences occur in the blue markings. 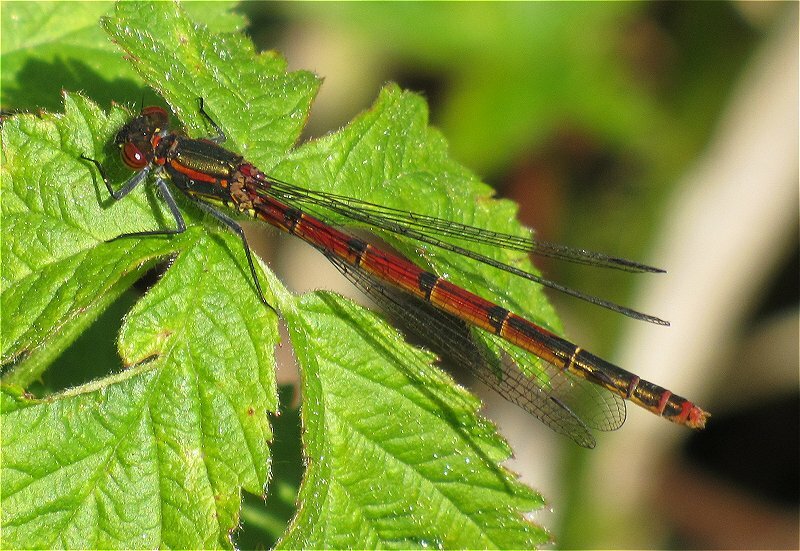 At rest the wing tips reach in to segment eight, in Small Red-eyed Damselfly the wing tips only reach as far as segment 6 or 7. 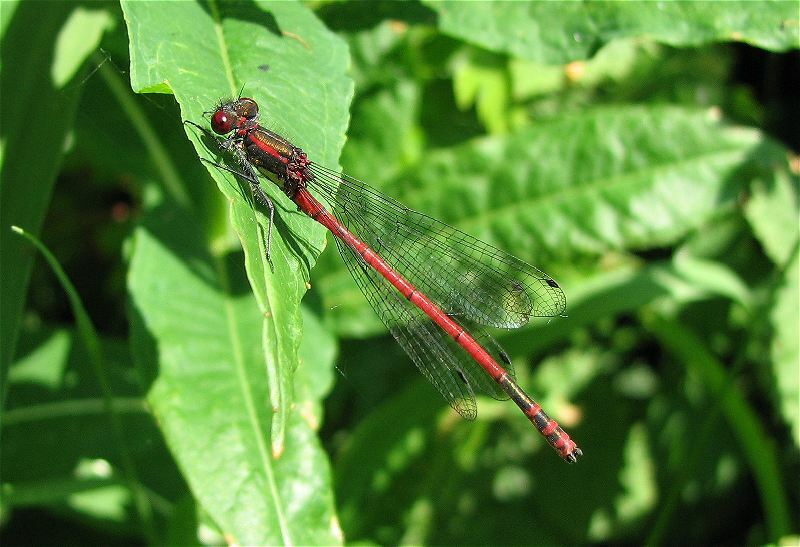 Generally holds its abdomen level, where as Small Red-eyed Damselfly often holds its abdomen slightly upcurved towards the end. 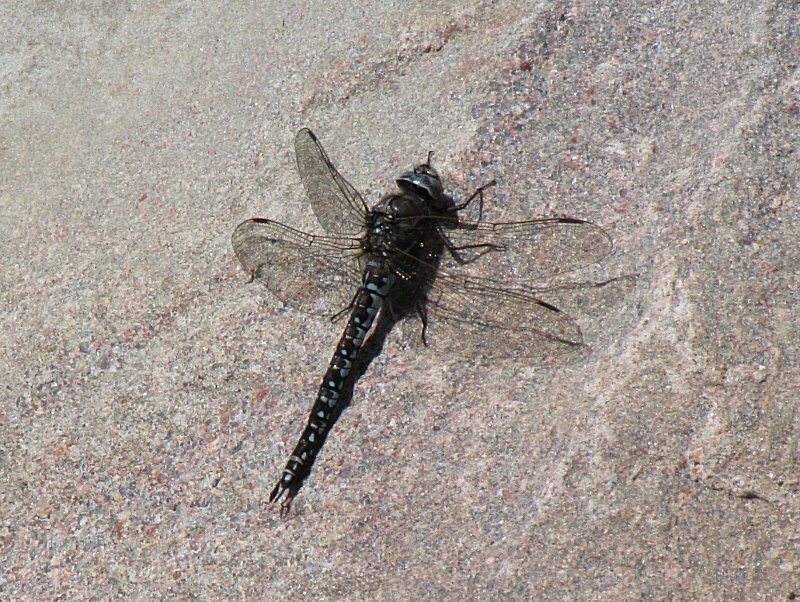 Mainly black with green sides to thorax containing black line and spur. Segments 9 and 10 are black with narrow blue divisions. Eyes are a dull red colour. Usually have short shoulder stripes, though some lack them all together and some may form as explanation marks. Strong direct flight over water. Spend lots of time resting on broad floating leaves such as water lilies. 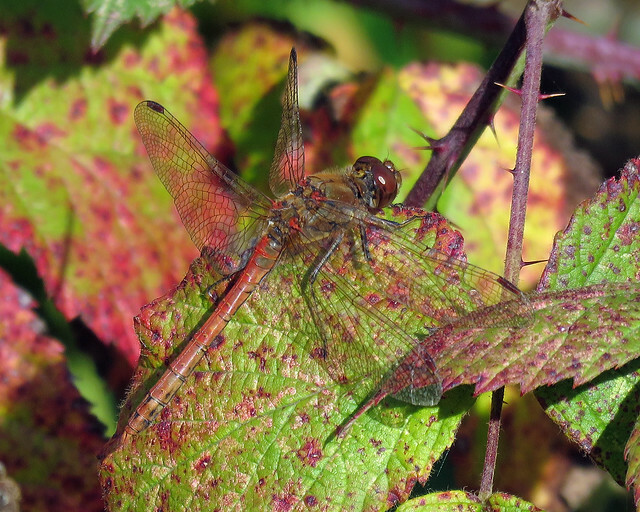 Mats of algae and debris are also used and males may use surrounding shrubs if there is little floating vegetation. After emergence they will spend time away from water to mature. 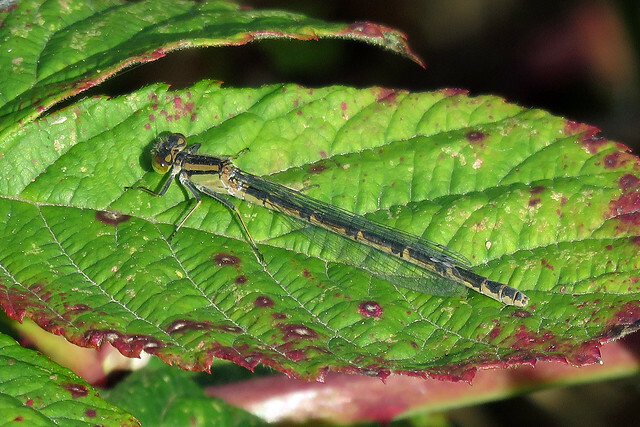 The first three weeks of emergence is probably the best time to encounter this species at close quarters. 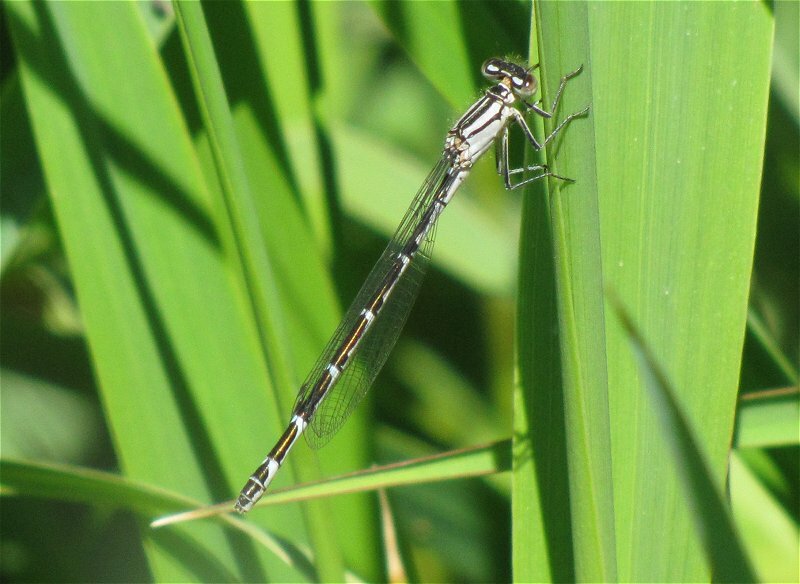 Females usually only appear at water to breed. 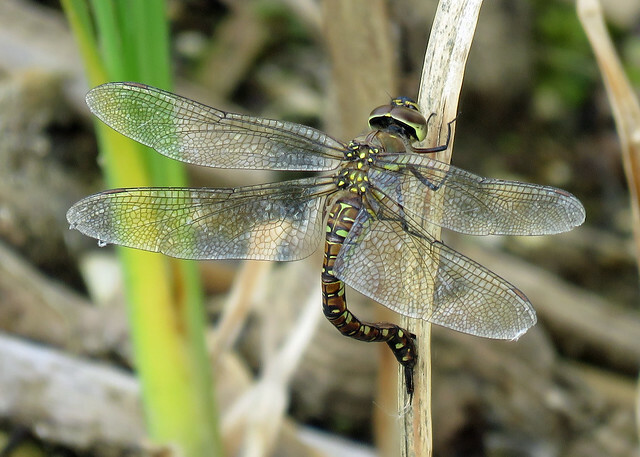 Copulation takes place over water or on nearby vegetation. 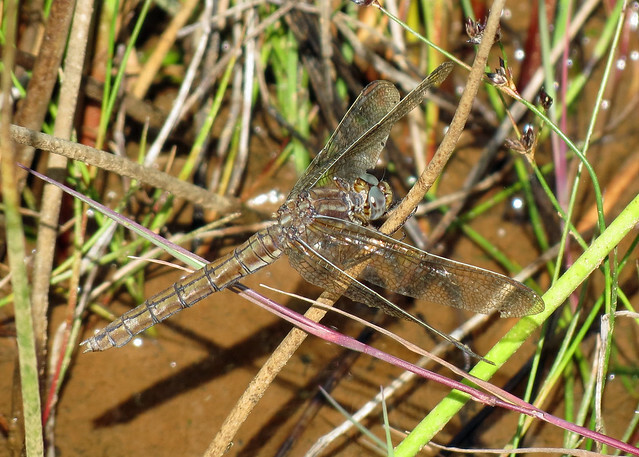 Egg laying is mainly in tandem, both sexes often submerging. 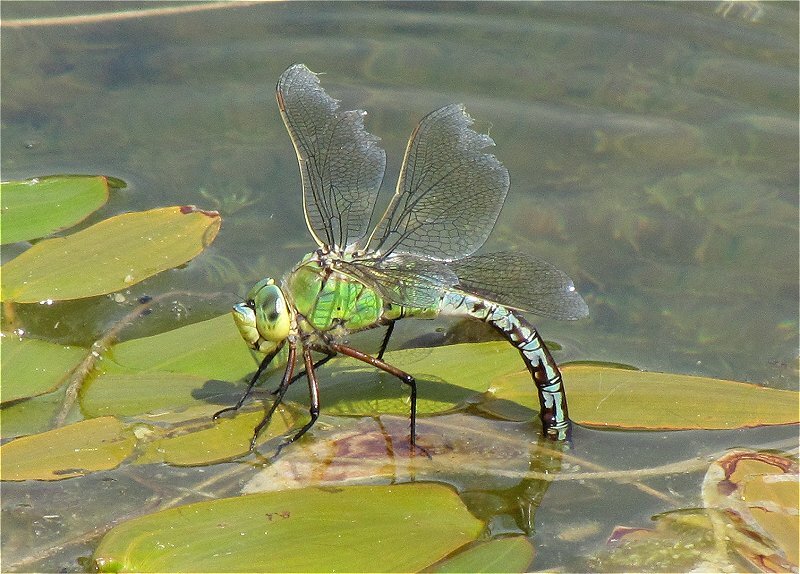 They are laid mainly on the underside of Water Lilies, though other floating vegetation will be used. Large lakes, ponds, canals and slow moving waterbodies with abundant floating vegetation. Nationally: Mid May to early September. Yorkshire: Mid May to late August. 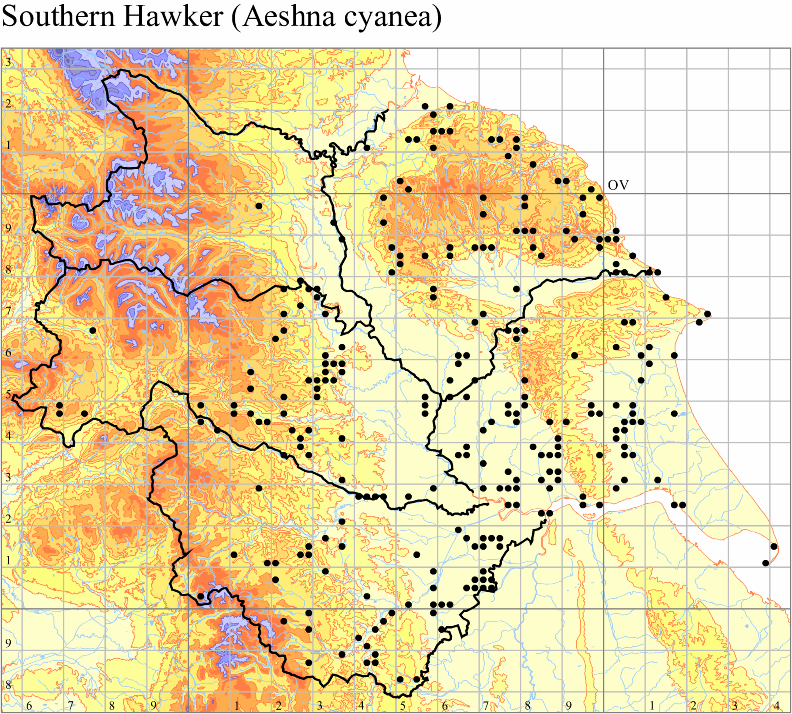 Species is at the northern edge of its range in Yorkshire. Current records confine it to VC61. 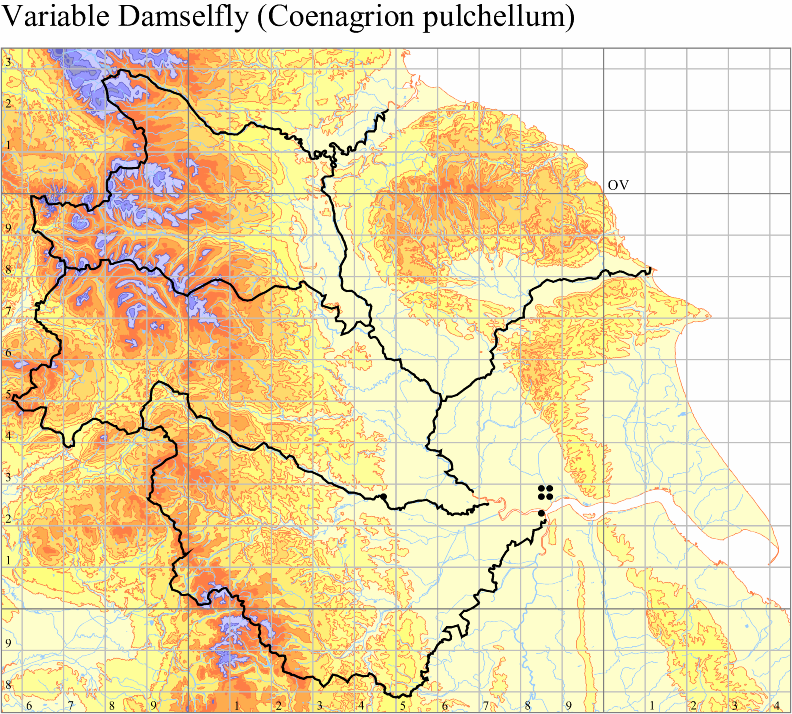 To the east of the Wolds its is present at Tophill Low, Leven Canal and Brandesburton Ponds. To the west of the Wolds it is present on Pocklington Canal becoming more abundant to the southwestern end of the canal. 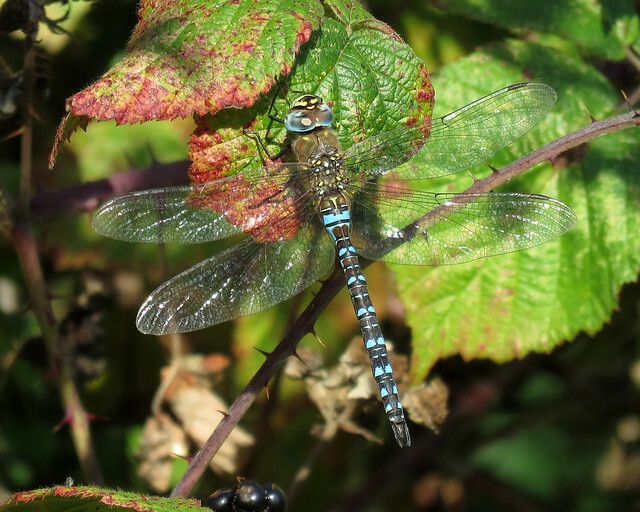 It has also recently been recorded along Market Weighton Canal and several ponds in the southwest of the riding. 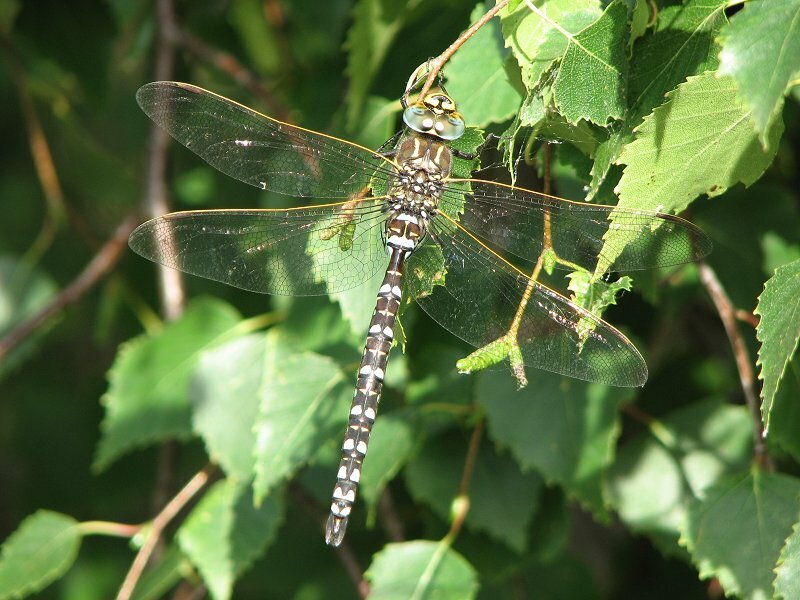 It is possible that this species is present in the northeastern edge of VC63. 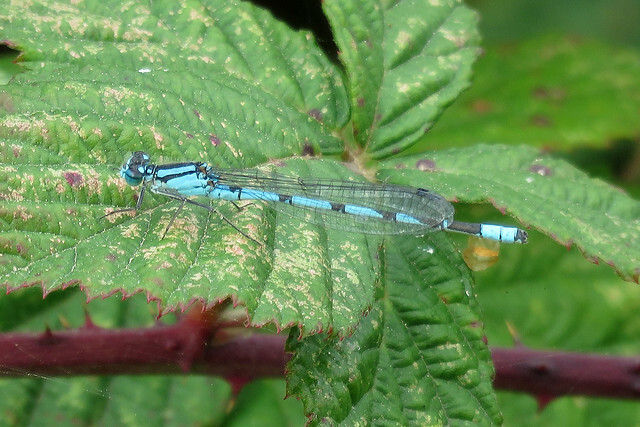 Coenagrion Spur’ on side of thorax, also present on Azure Damselfly, but absent on Common Blue Damselfly. Antehumeral stripes are usually broken, sometimes they can be absent or complete. Wine glass marking on segment two of the abdomen. Segment nine contains a square with three points (three pointed crown). 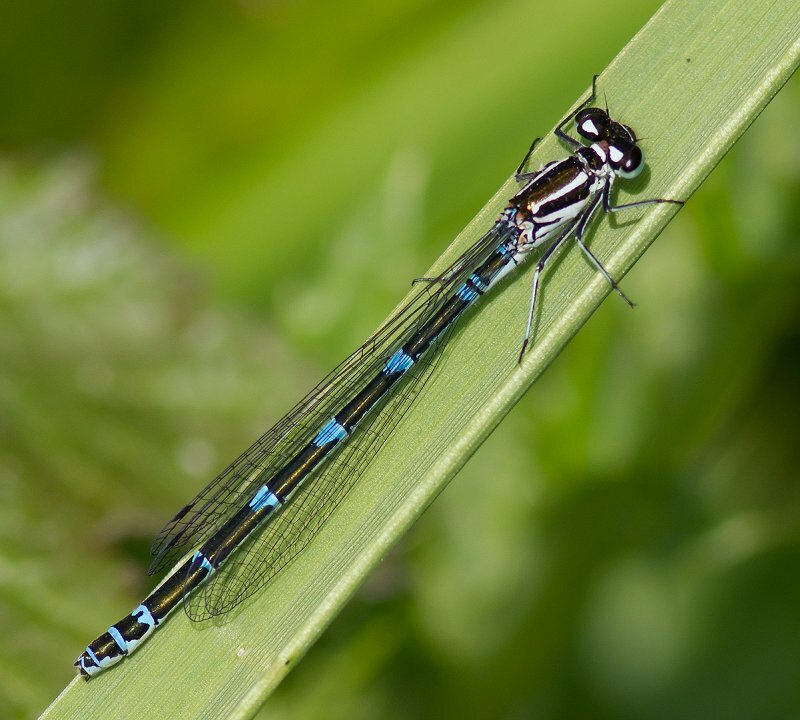 Overall appears more slender and darker than the similar Azure Damselfly. Can be confirmed by the strongly trilobate margins of the pronotum. 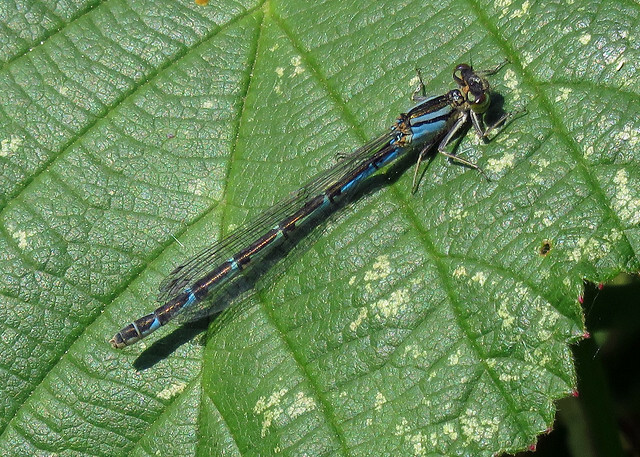 ‘Coenagrion Spur’ on side of thorax, also present on Azure Damselfly, but absent on Common Blue Damselfly. Antehumeral stripes are usually complete. Black thistle shape on segment two. 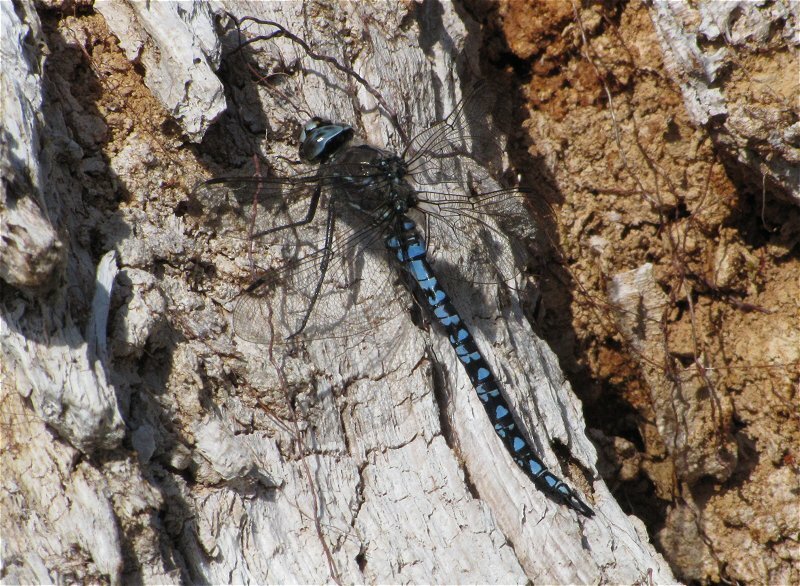 Blue form, blue on top of the abdomen. 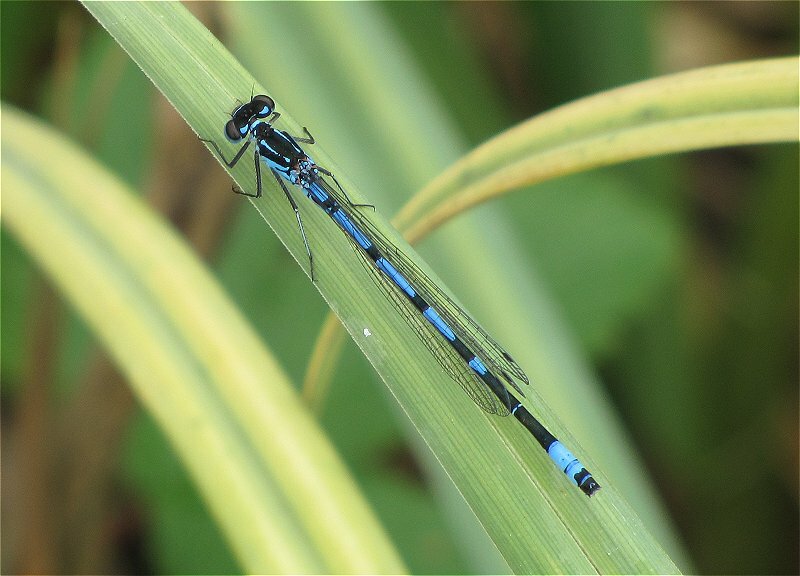 Dark form, similar to Azure Damselfly is not as numerous. 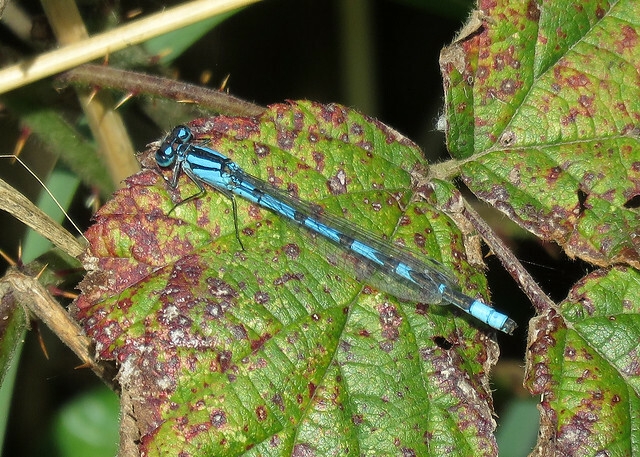 Overall appears bluer than the similar Azure Damselfly. 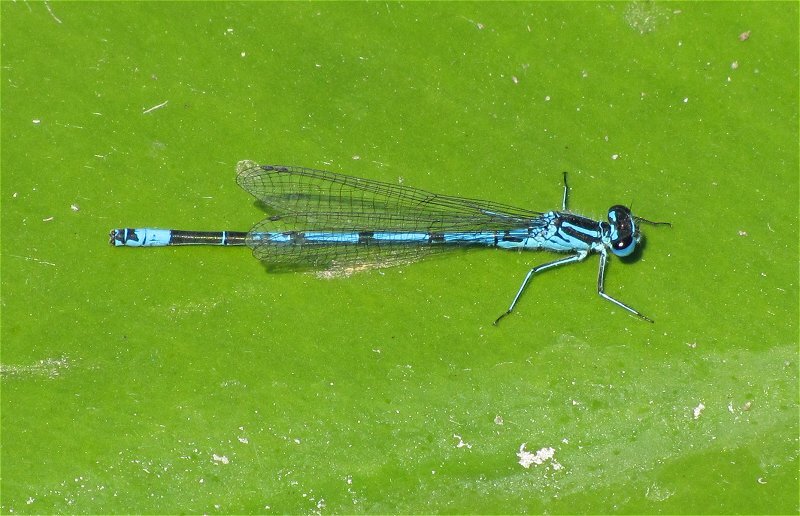 Note: The shape of the pronotum is the only conclusive way to seperate this species from Azure Damselfly. 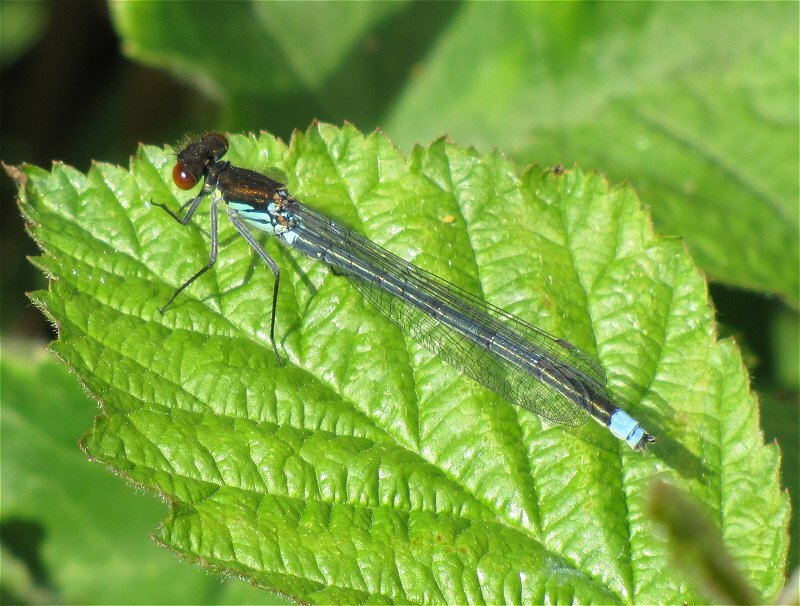 Personal observations have highlighted that female Variable Damselflies have a bar between the eye spots, which is absent in Azure Damselfly. 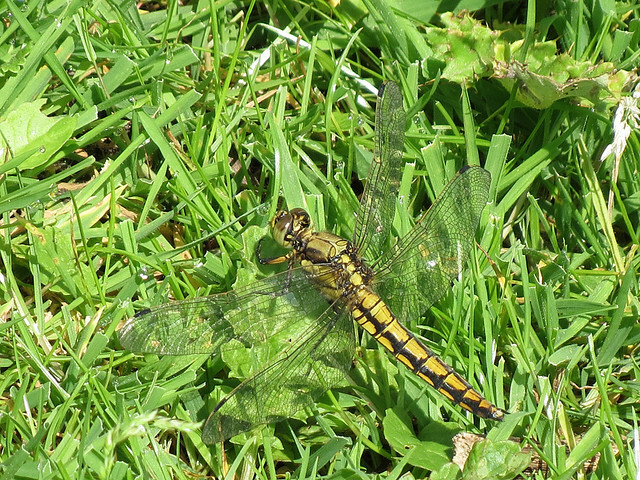 Mainly encountered near the waters margins. Immatures often found in adjacent grassy areas. Shelter in the lee of bushes or hedgerows in windy weather. Stagnant or slow moving water such as grazing-marshes, ditches, ponds, lakes and canals which are well vegetated. 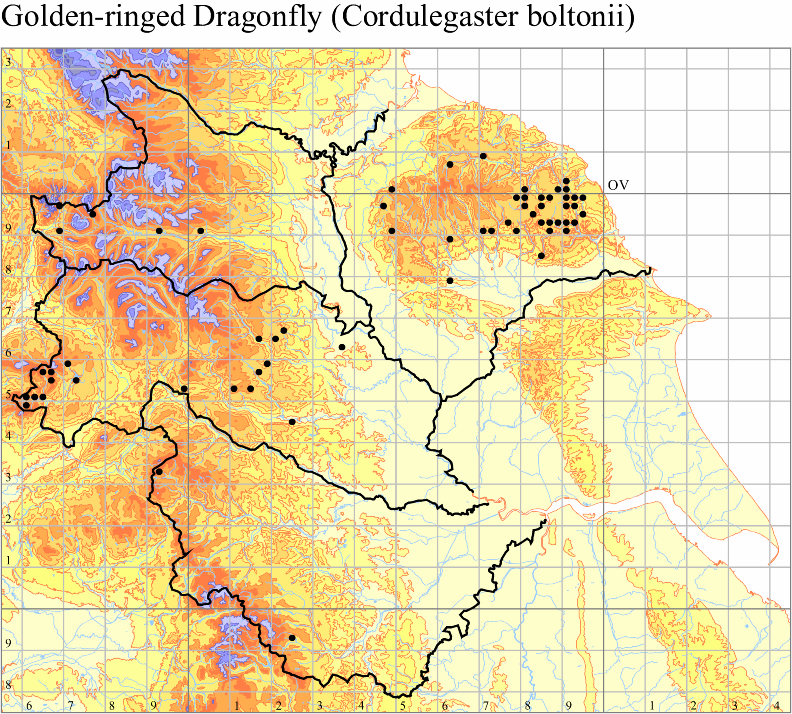 Can be restricted to small colonies despite there being obvious surrounding suitable habitat. National: Late April to mid-August, though more usually mid-May to early August. Yorkshire: Mid-May to late June. 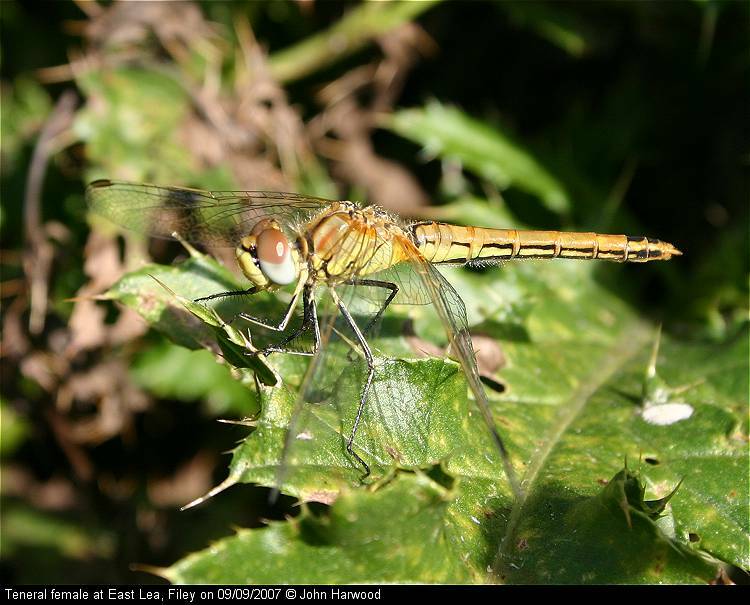 After a tentative report in 2006, now confirmed as being present in East Yorkshire. Currently restricted to the Broomfleet Washlands complex. 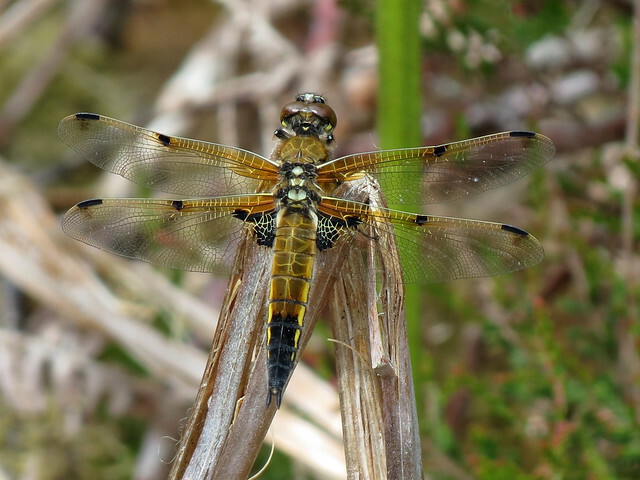 This is currently the only species present in Yorkshire that is of national importance due to its near threatened status. 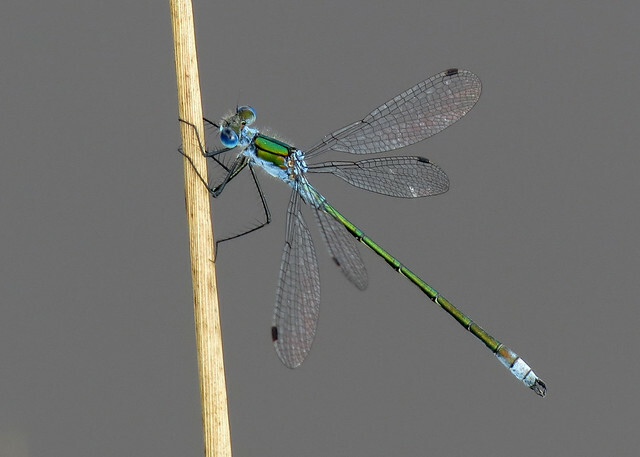 Thorax bright green; abdomen blue with black central line; legs black; eyes green; wings clear with yellow costa. Generally greenish with thicker black central abdominal line. 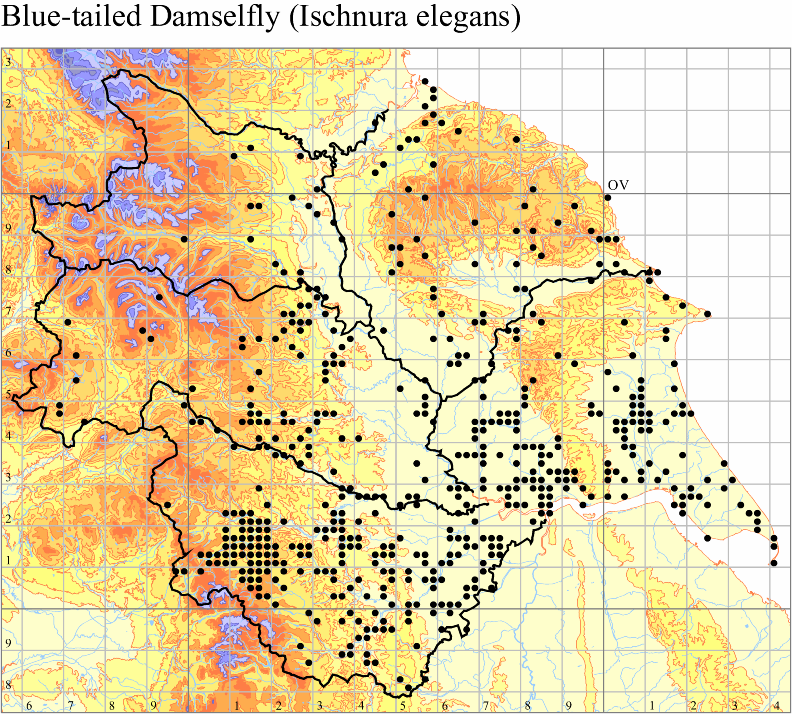 Canals, gravel pits, lakes and ponds. 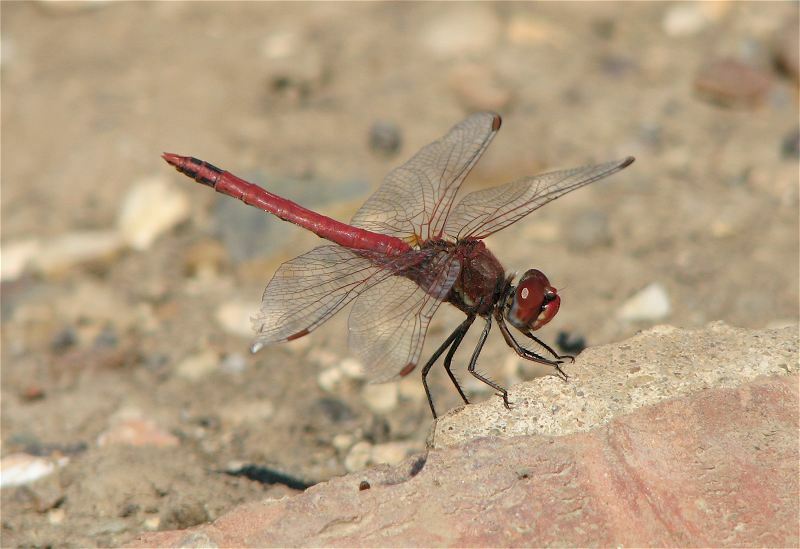 Males have strong flight, flying low over territorial waters. 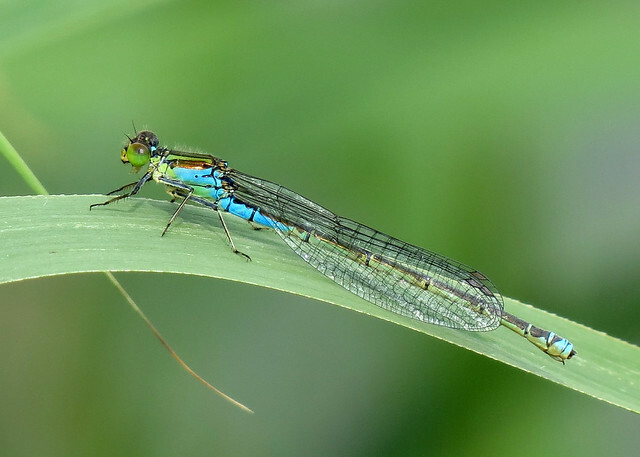 Females lay eggs alone into floating vegetation. Late May to mid-August. In Great Britain found in most of England and Wales, south of Lancashire/ Humber. Gradually spreading through the East Riding. 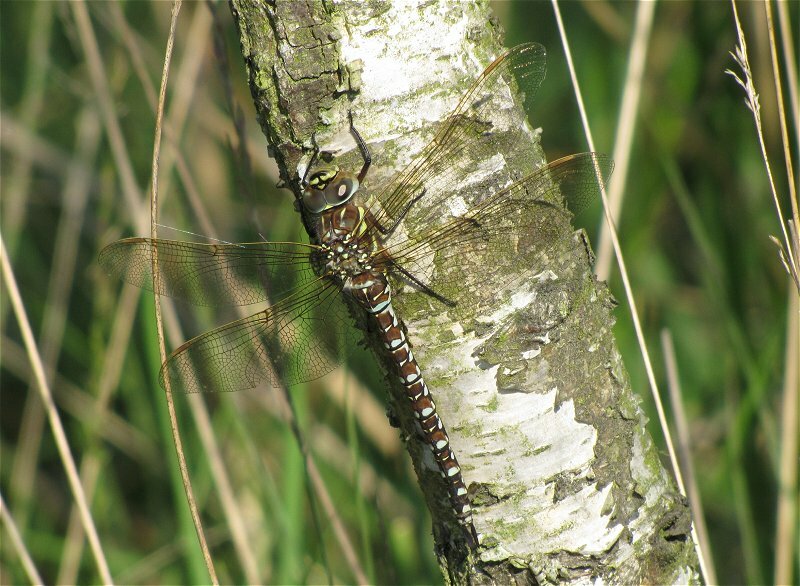 The only ‘Hawker’ species flying during May and much of June, with a slight overlap with Southern Hawker at the end of June. Thorax and abdomen distinctly hairy. 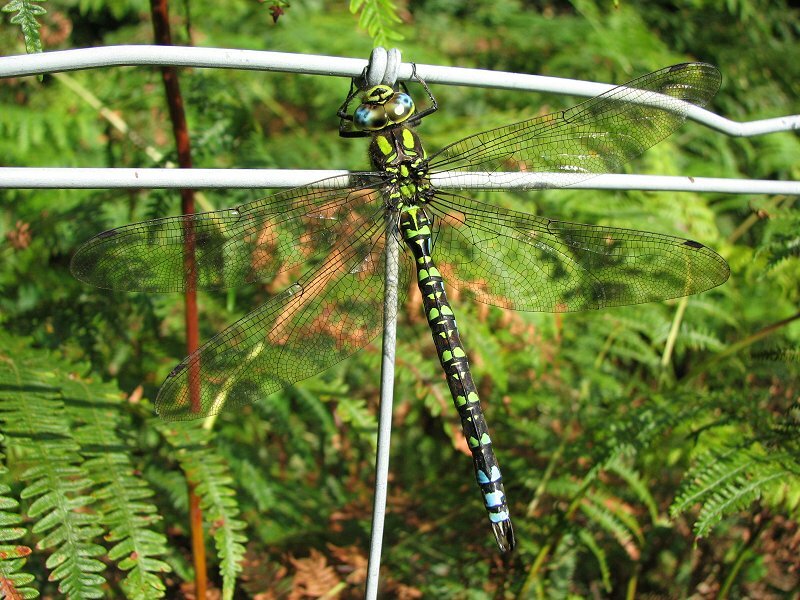 Side of the thorax predominantly green, lacking the paired thoracic stripes of other ‘hawker’ species, with tapering green antehumeral stripes on the top. 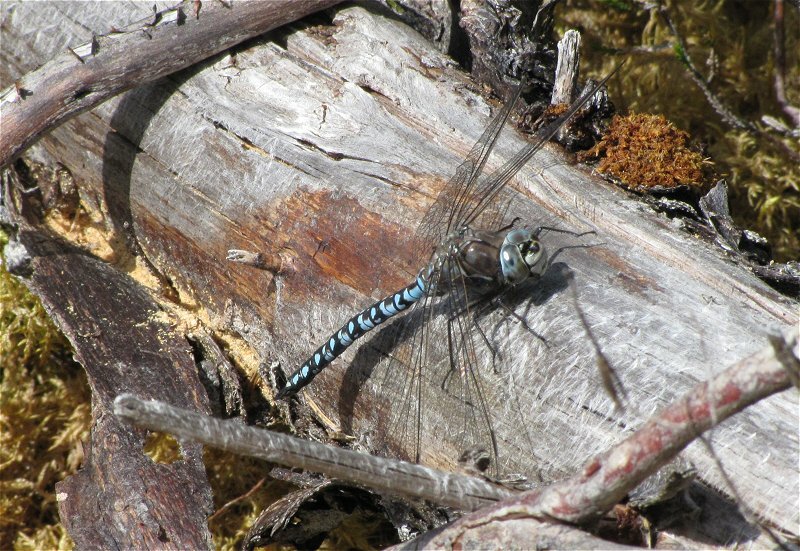 Abdomen has small blue paired spots. Thorax and abdomen distinctly hairy. 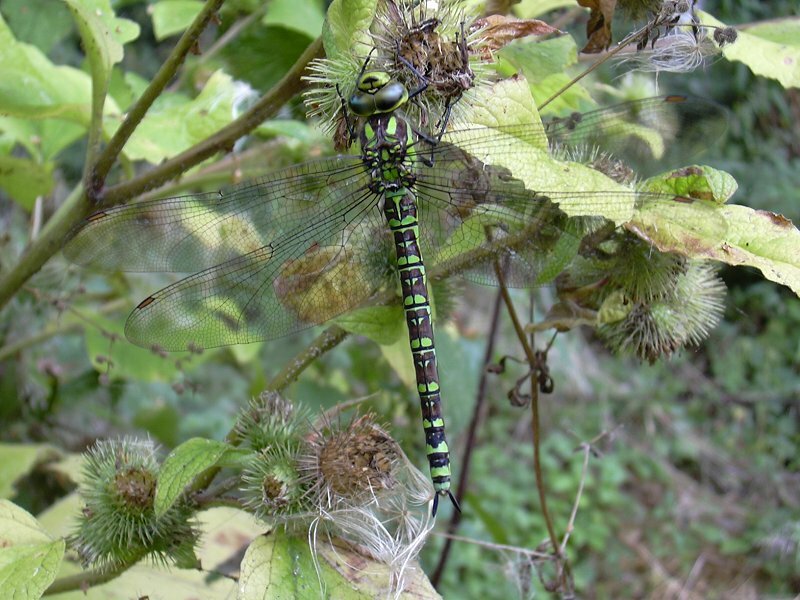 Side of the thorax predominantly green, lacking the paired thoracic stripes of other ‘hawker’ species, with restricted, or absent, antehumeral stripes on the top. 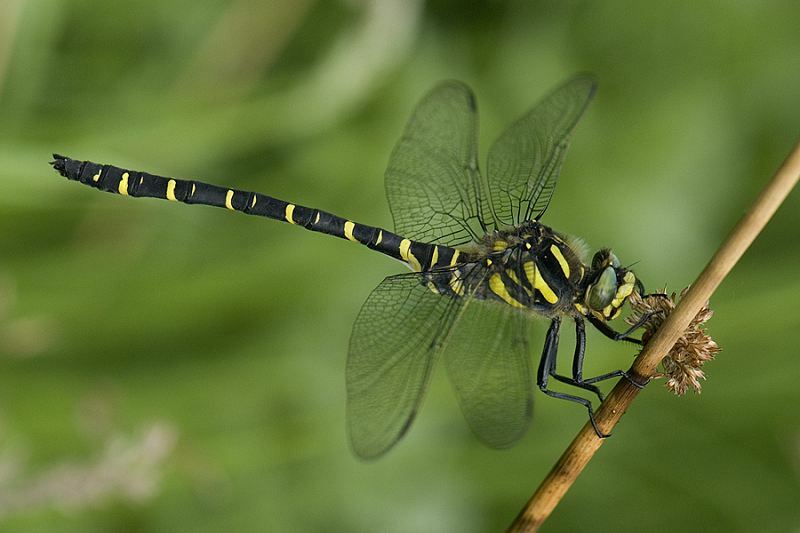 Abdomen has small yellow paired spots. 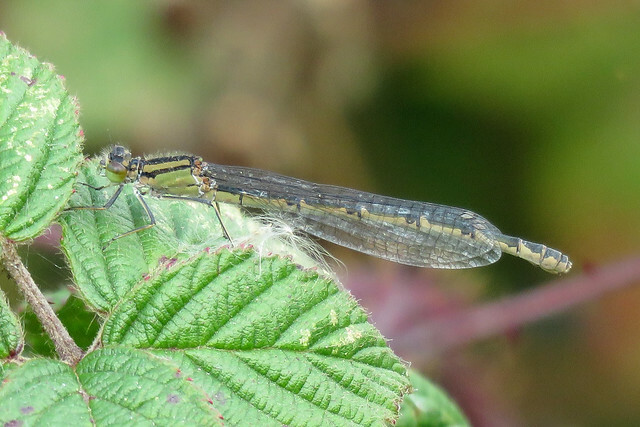 Recent colonist to VC61 with good numbers found along Leven Canal. 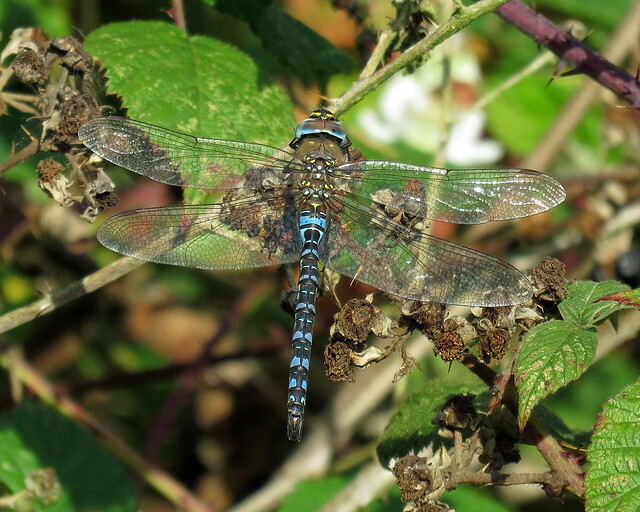 Scarce in VC63 with recent records from Campsall Country Park and Potteric Carr. 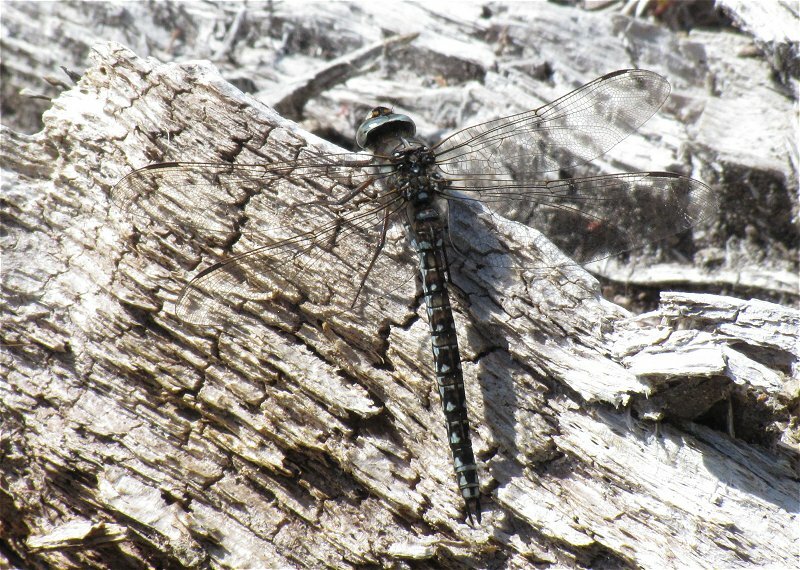 Dark brown thorax with buff antehumeral stripes, which fade with age. 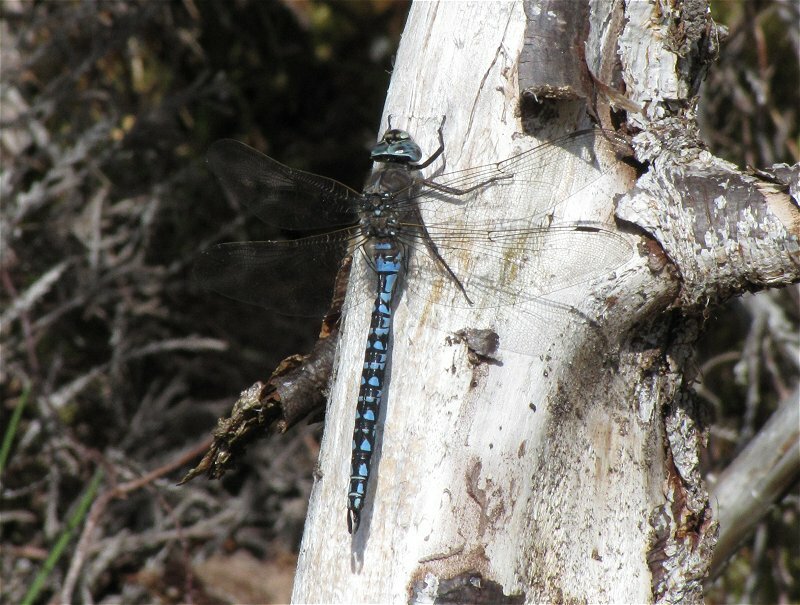 When mature the abdomen is blue, except S1. Blue grey eyes. 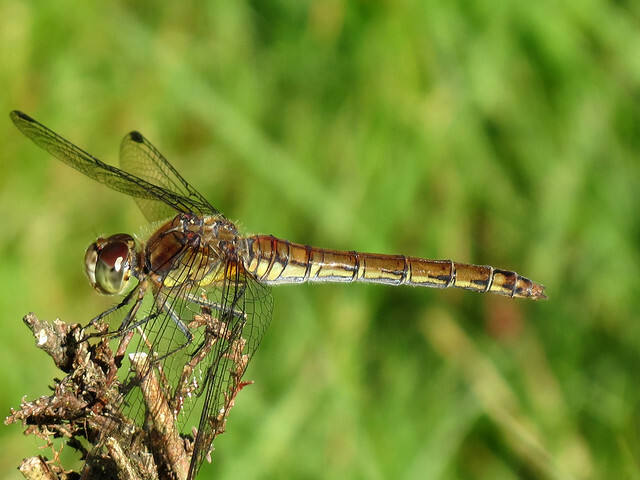 Wings have a yellow tint when immature which clear as they mature. Pale yellow costa and orange pterostigma. Blue grey eyes. 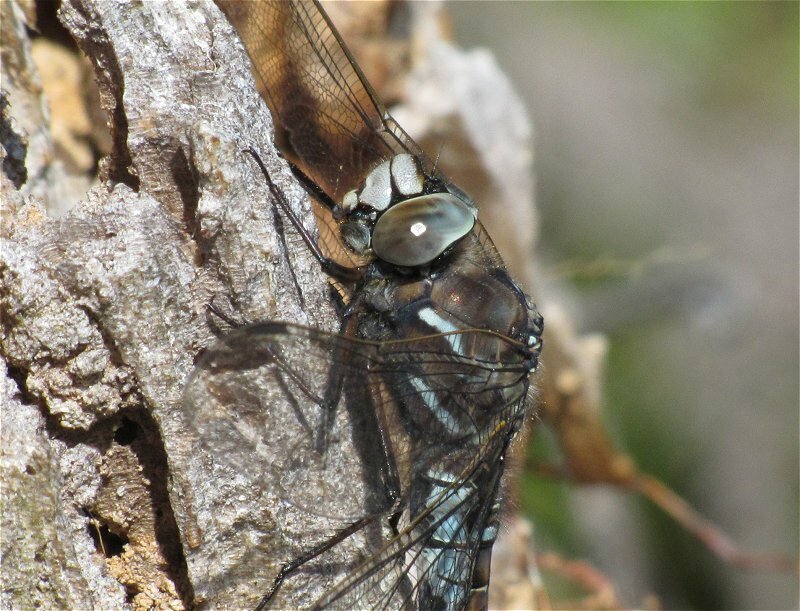 Dark brown thorax with buff antehumeral stripes. 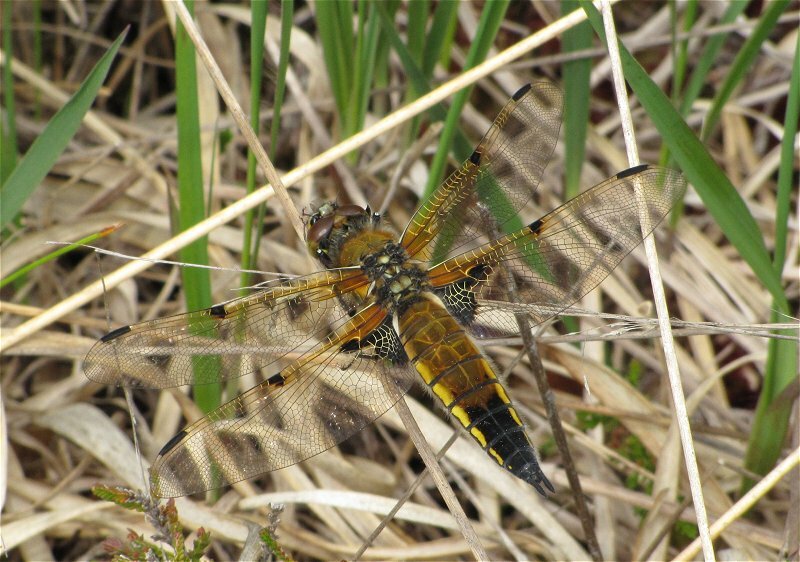 The abdomen is a yellow/brown colour with a thin dark keel line down the centre. Pale yellow costa and orange pterostigma. 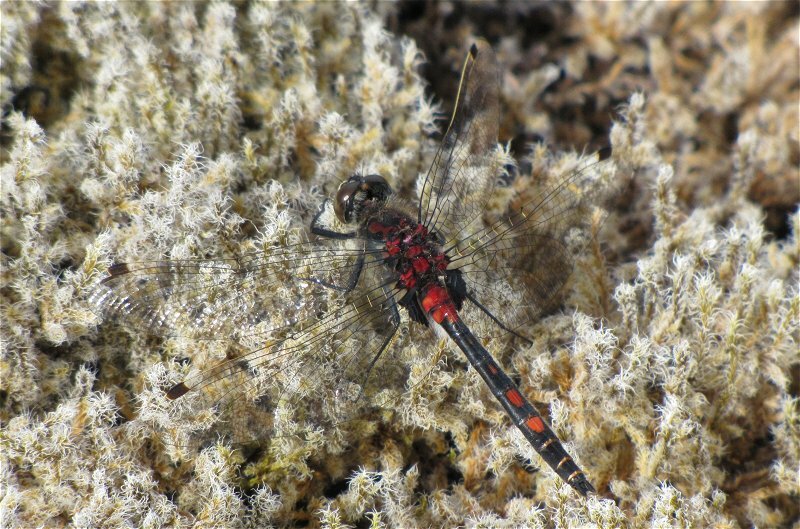 Males have small territories observing them from the ground or low perches. Copulation occurs on the ground and can last anything from 2-60 minutes. Flight is fast and erratic with brief spells of hovering. Wings are held well forward when at rest. 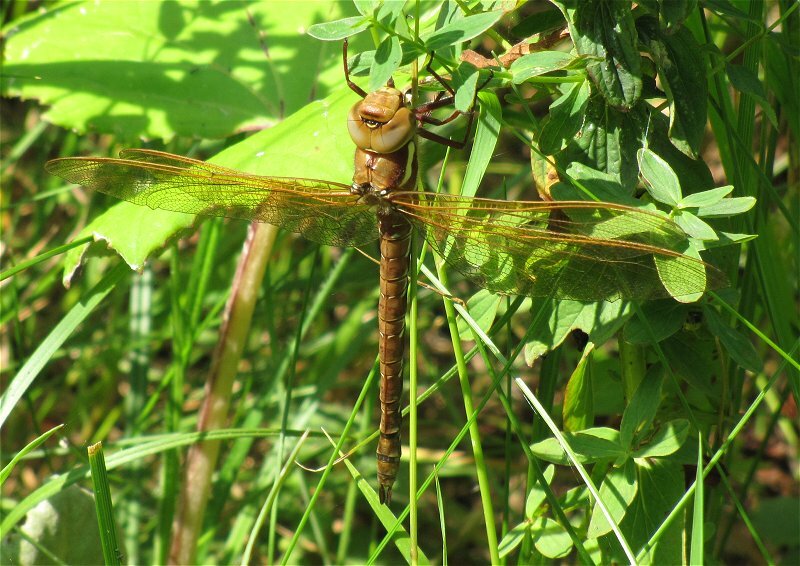 Females spend a lot of time resting in vegetation not far from water. 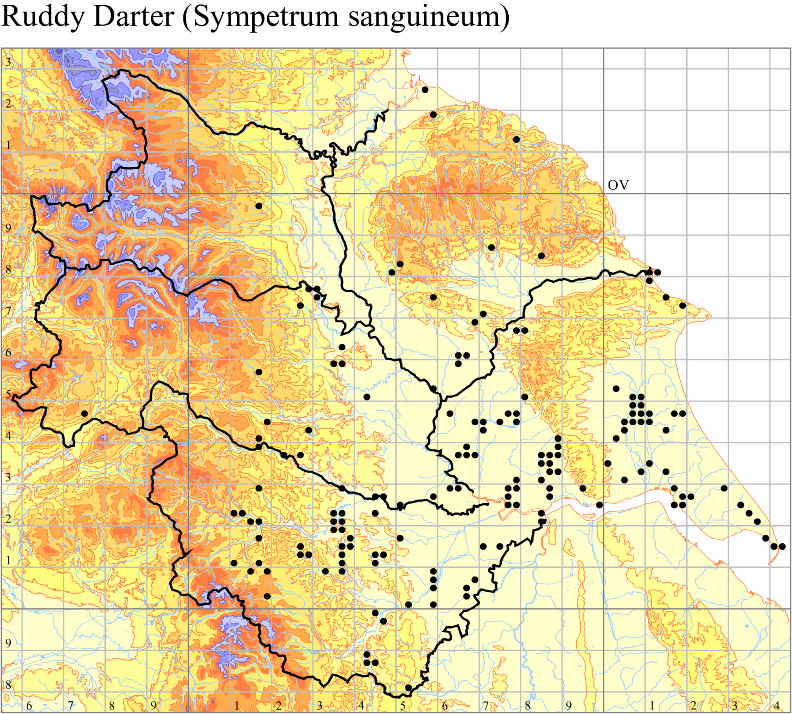 Acidic wet heath and peaty moorland sites typically with sphagnum mosses, frequents pools, runnels and streams. National: Mid-may to late September, usually early June to late August. Yorkshire: Mid-June to early August. 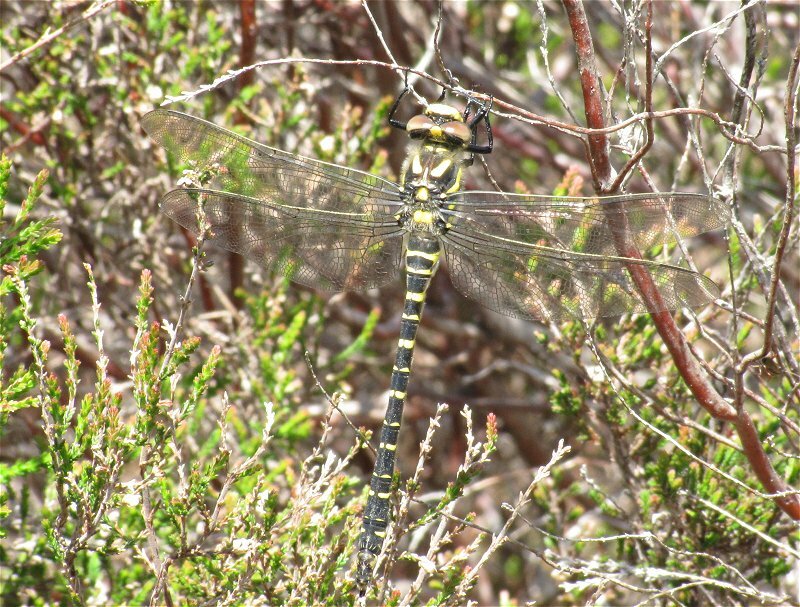 Confined to VC62 where it appears to be present in suitable sites surrounding Fylingdales Moor.